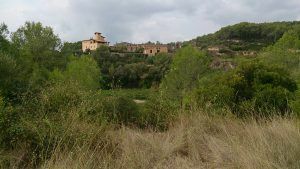 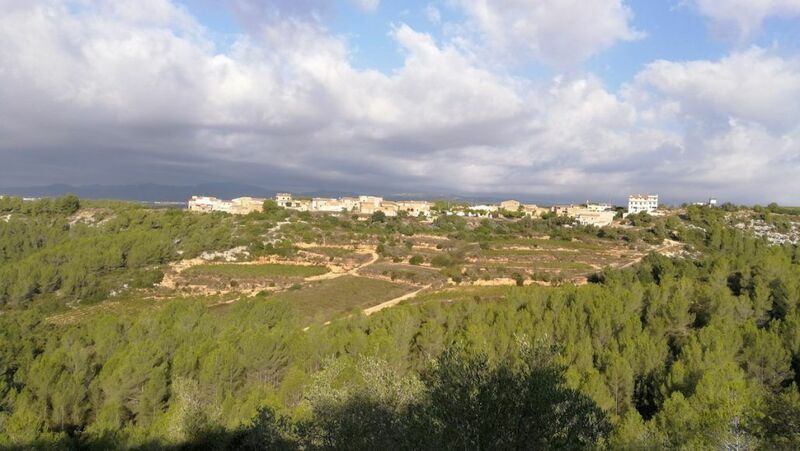 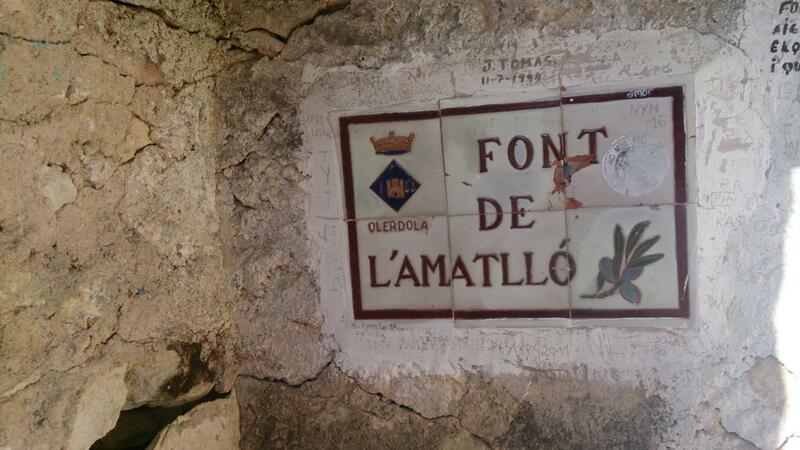 This municipality is situated only 30’ away from Barcelona and 40’ from Tarragona. 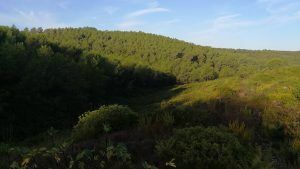 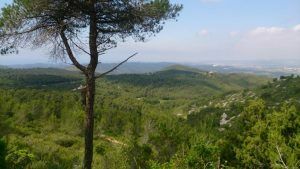 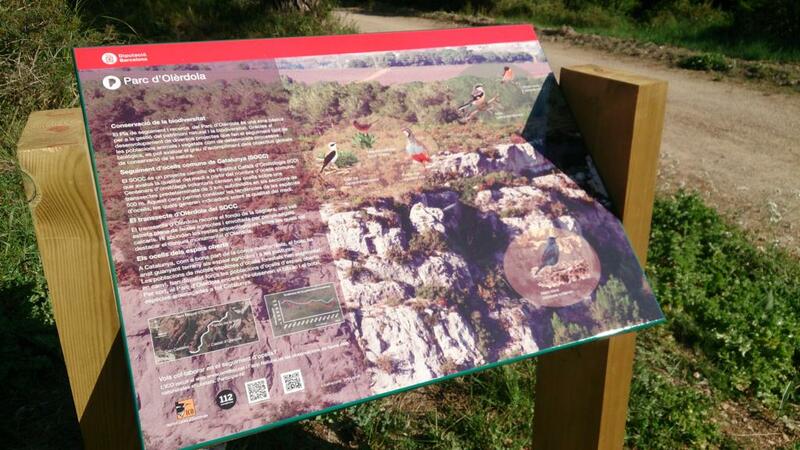 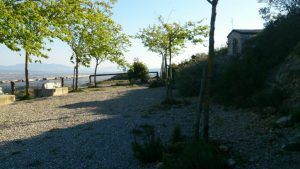 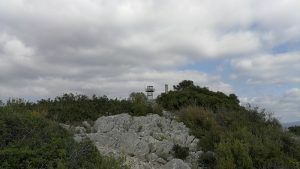 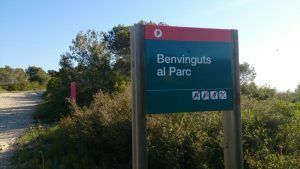 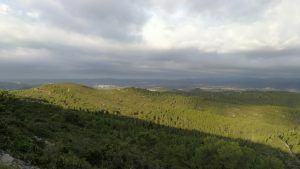 It is set in a privileged location, between three national parks: Parque del Garraf, Parque del Foix (and its marsh) and Parque de Olèrdola. 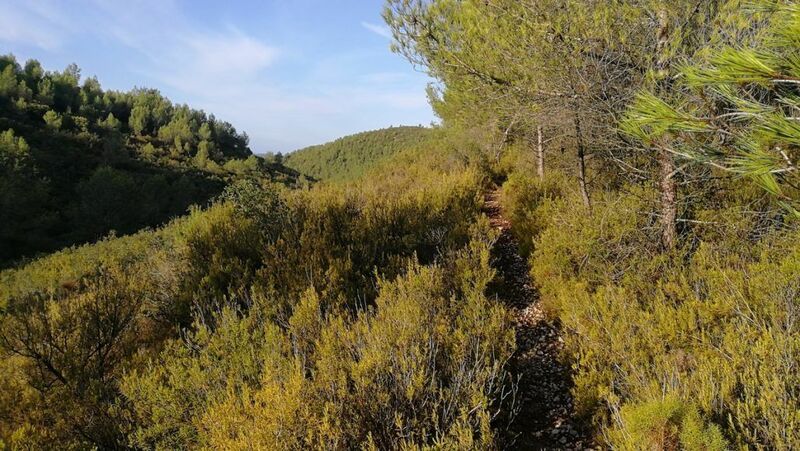 Canyelles offers an astonishing valley covered by vineyards, ideal for training throughout the year because of its mild Mediterranean climate. 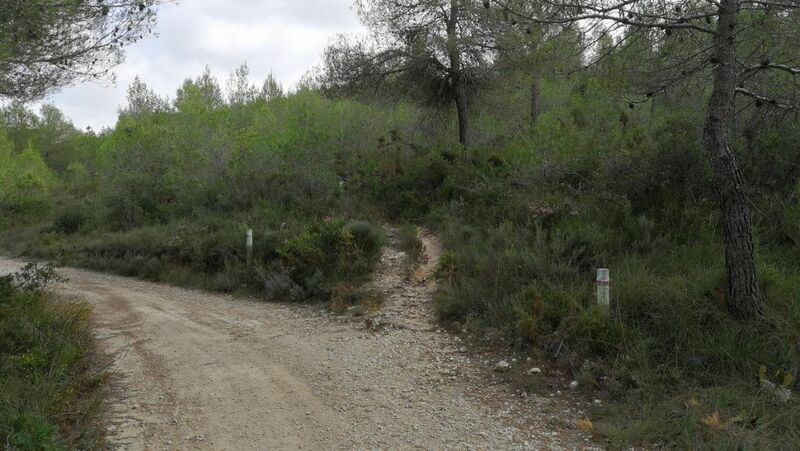 These mid distance trails have been designed to suit to a wide range of abilities. Some of the circuits are more technical, some others are faster and easy to follow. 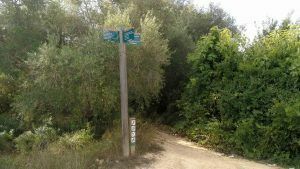 For further details, check the summary of each route. 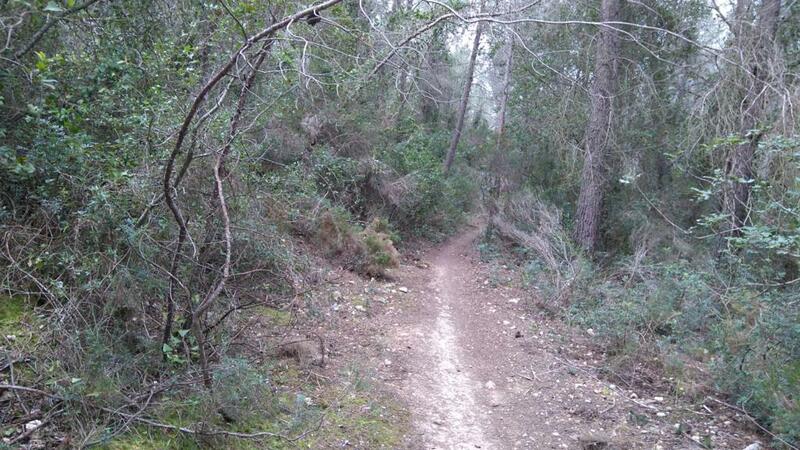 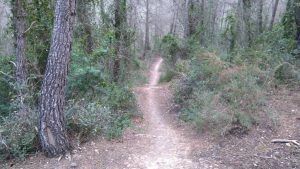 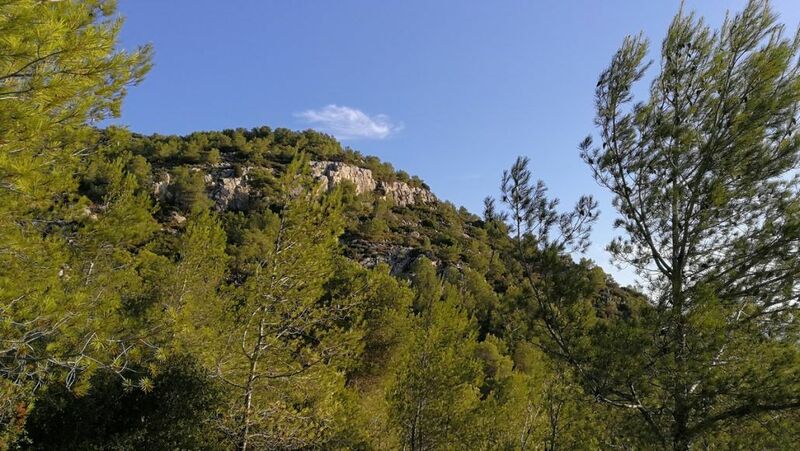 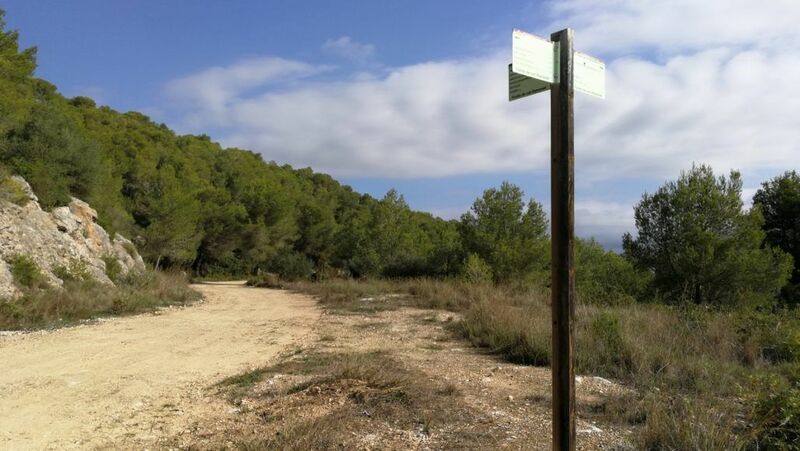 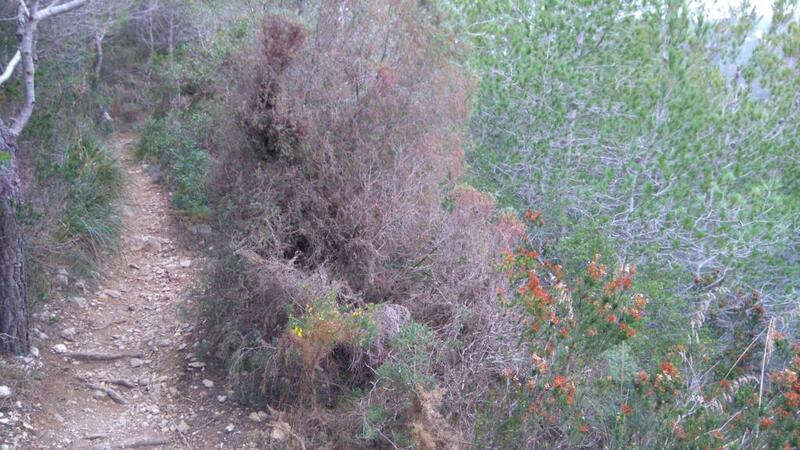 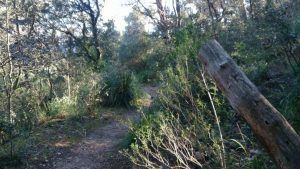 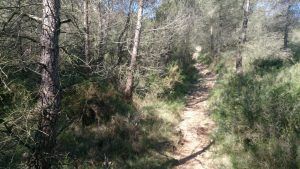 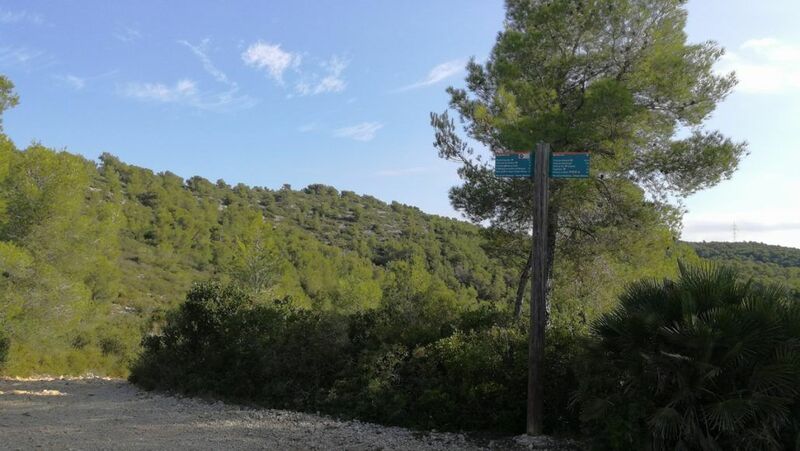 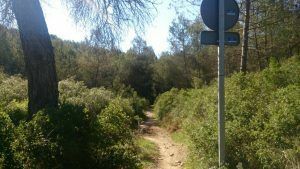 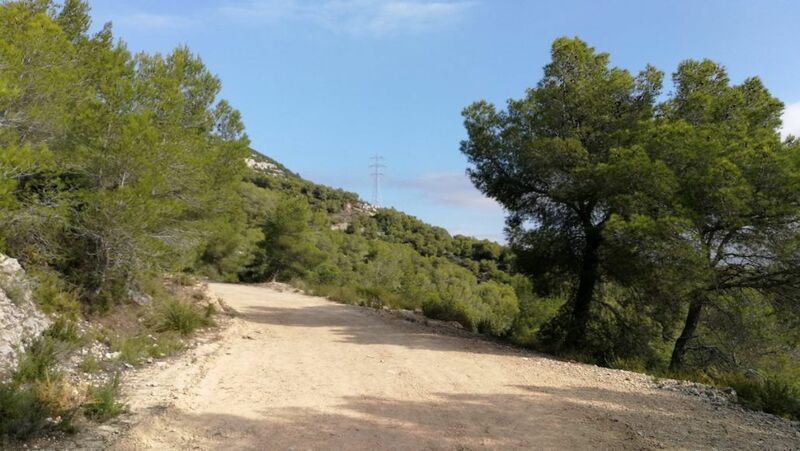 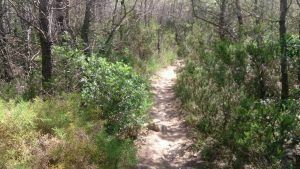 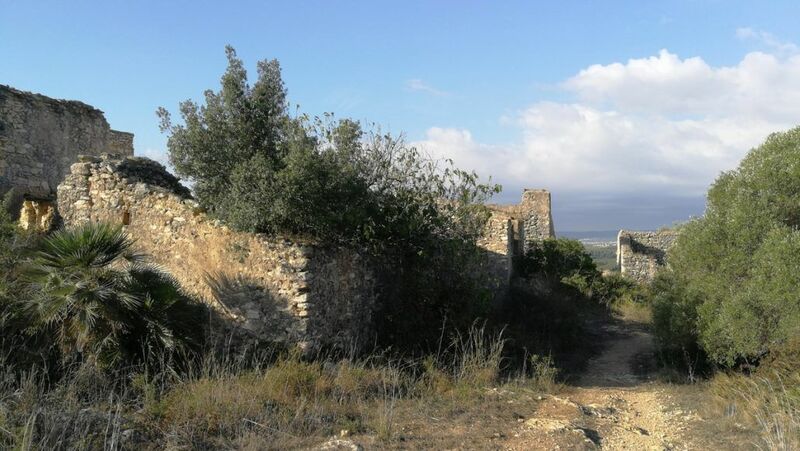 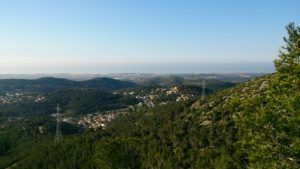 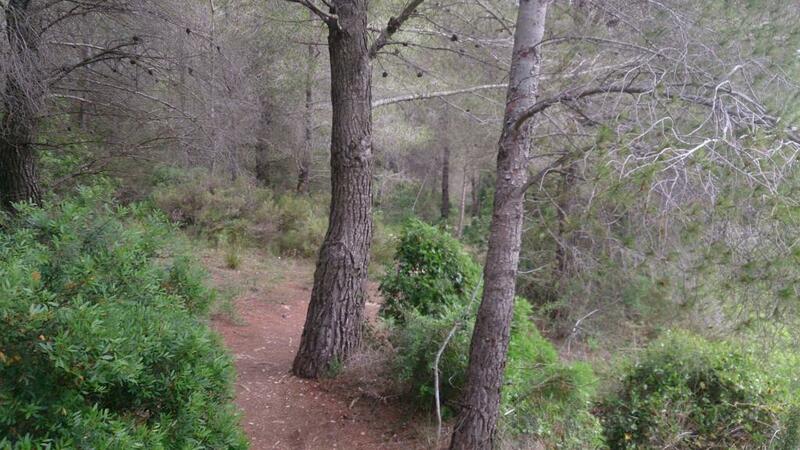 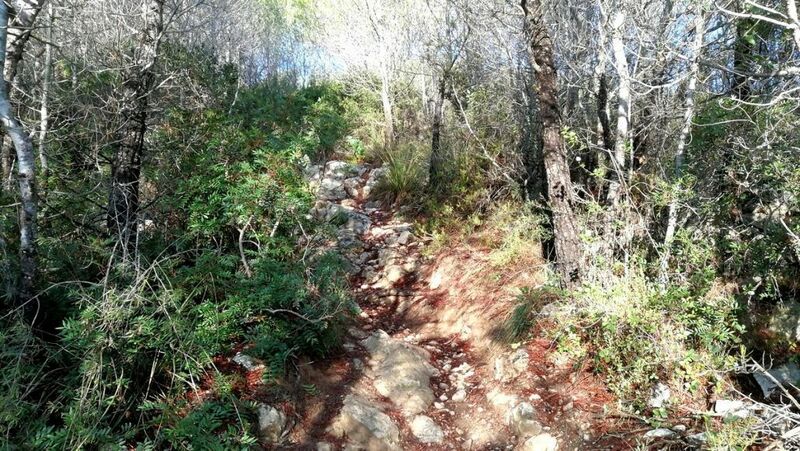 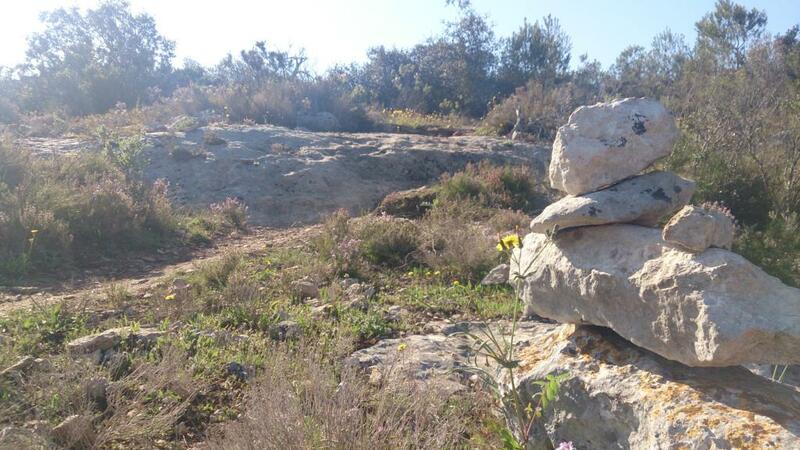 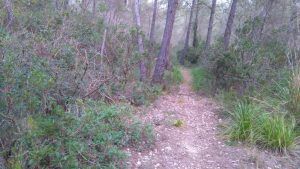 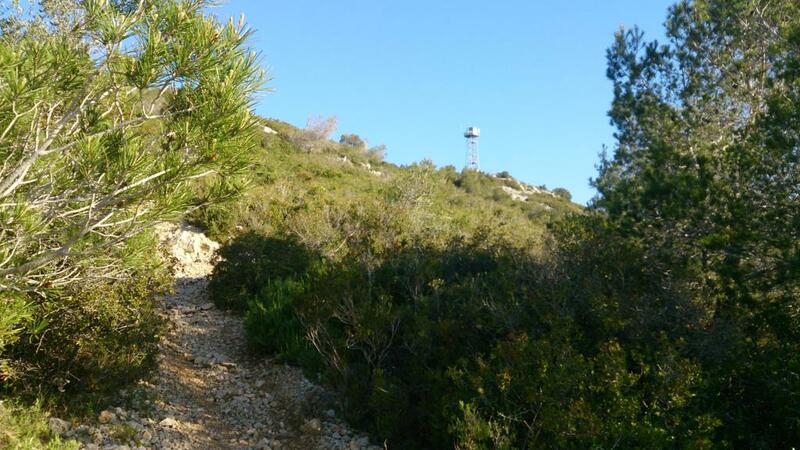 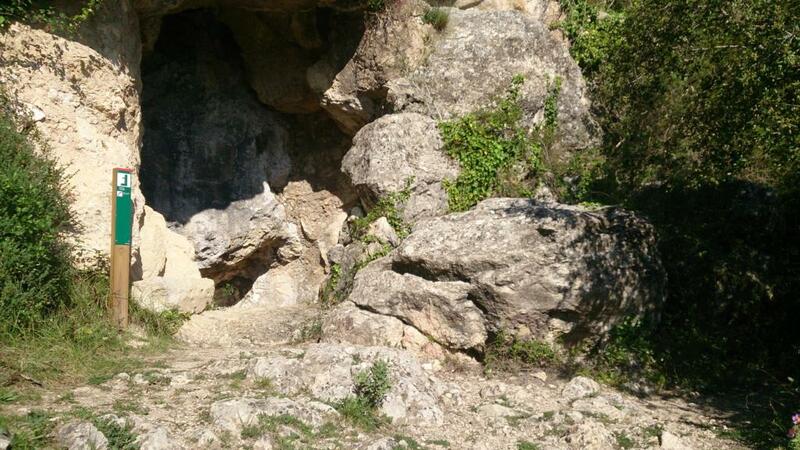 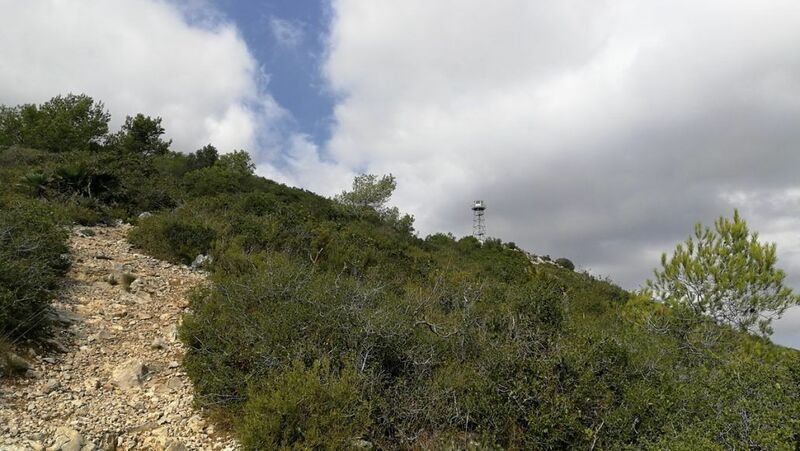 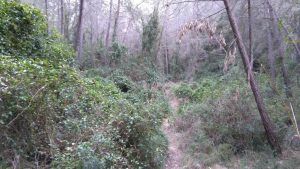 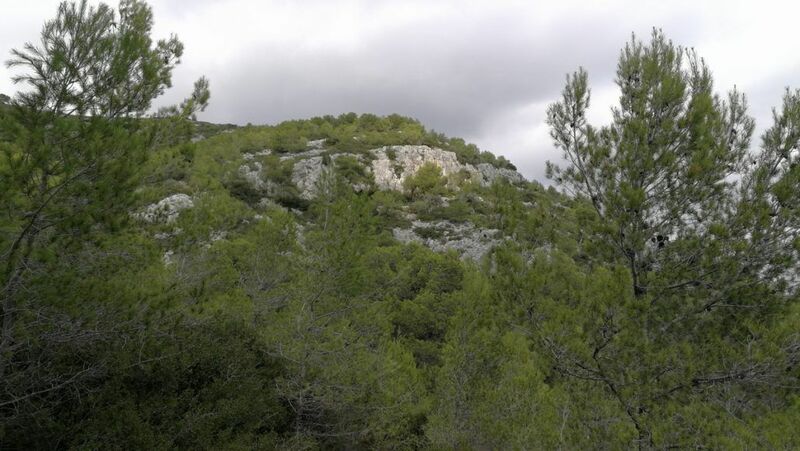 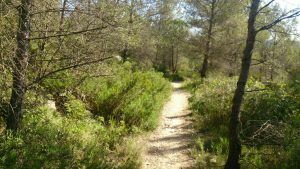 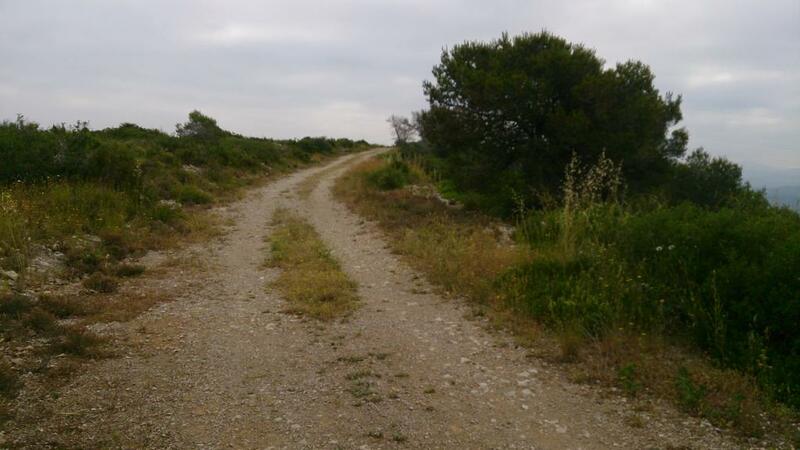 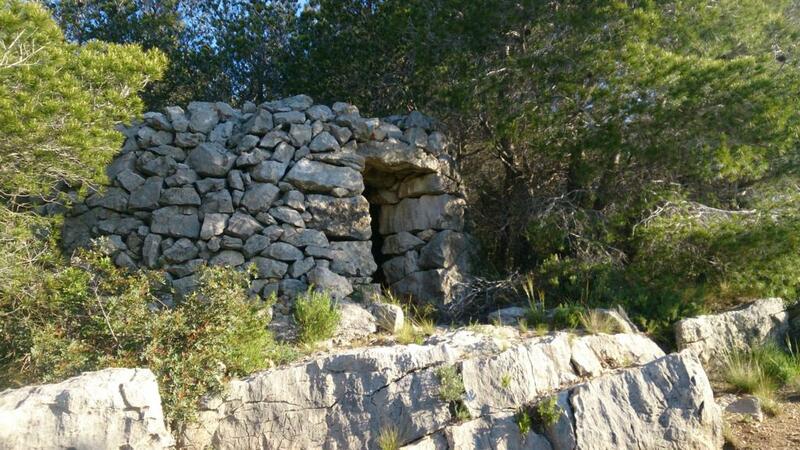 This trail will take you to charming hideouts and small hidden valleys around Garraf. The best time to visit is from autumn to spring. Avoid the central months of the year because of the high temperatures and rates of humidity. But if you still decide to do this trail in summer, make sure you avoid the midday sun and you carry plenty of water. The circuit starts from Plaza del Casal. Start walking along the torrent and, after crossing Daltmar street, take a path that will bring you to a wide track. Follow the track until you pass by a house. 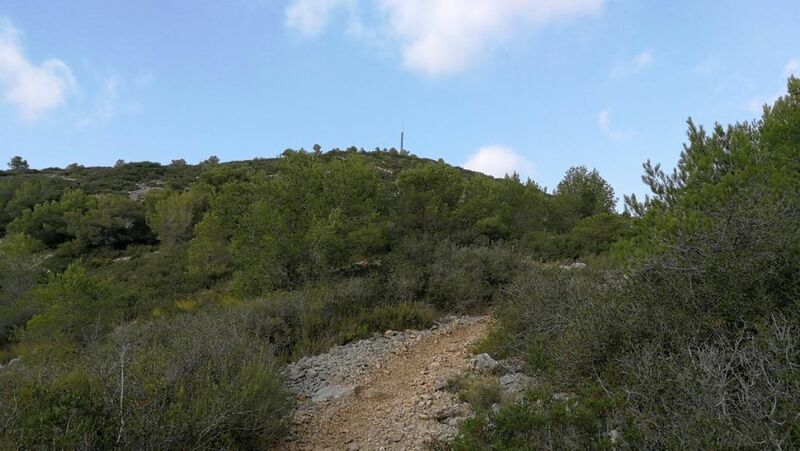 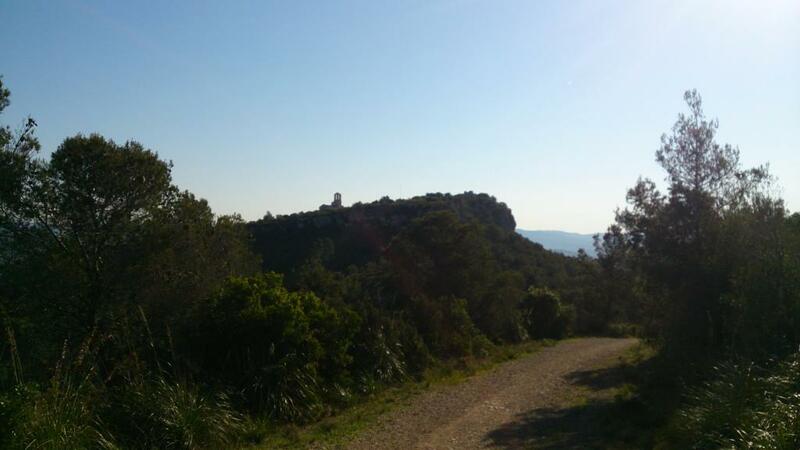 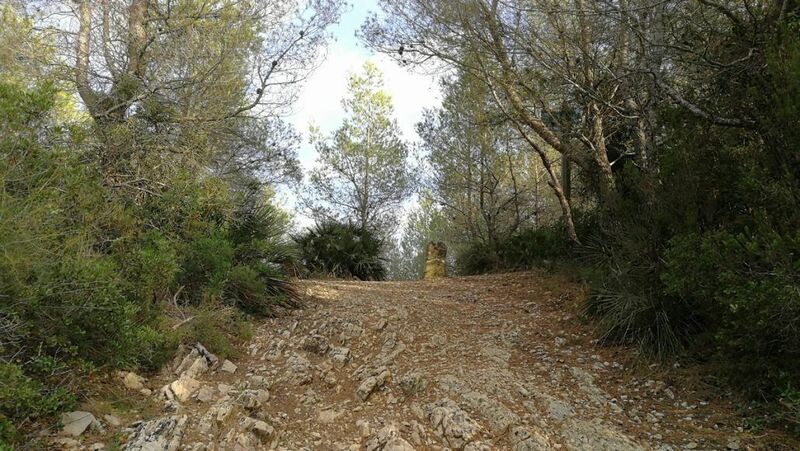 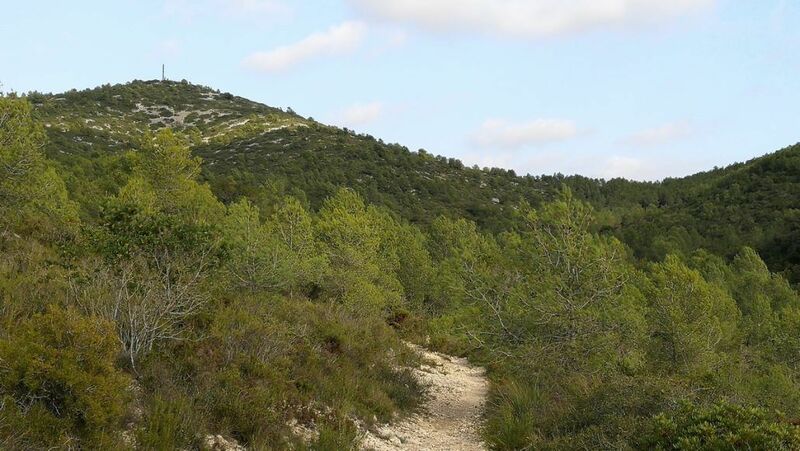 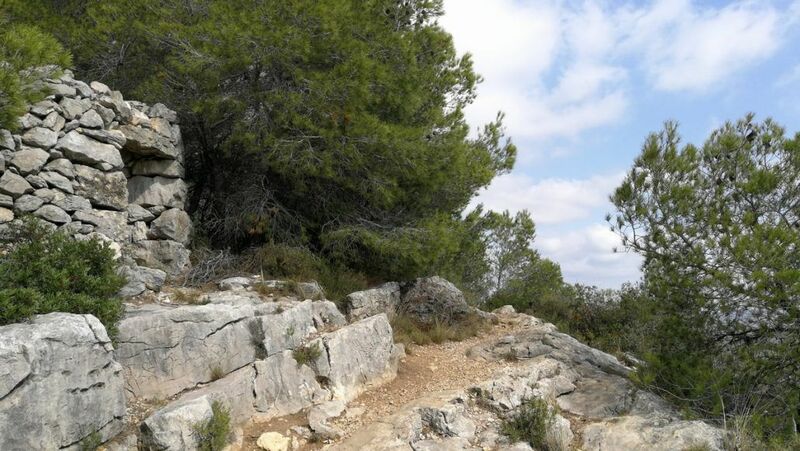 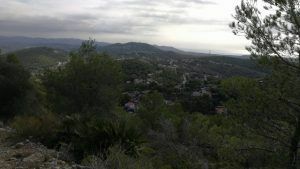 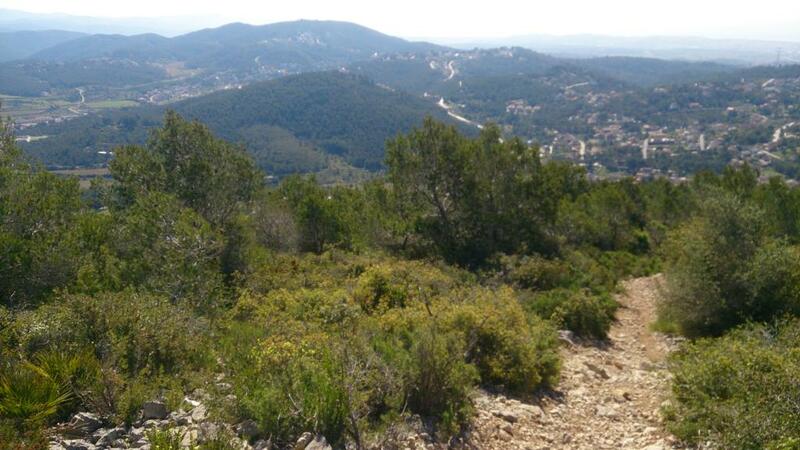 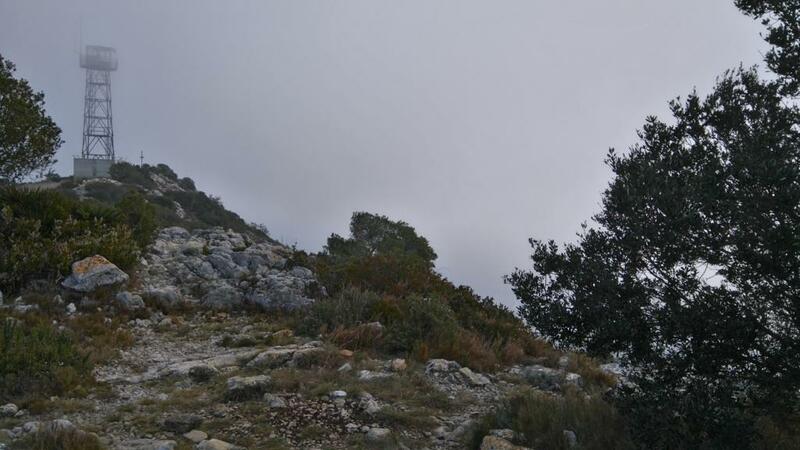 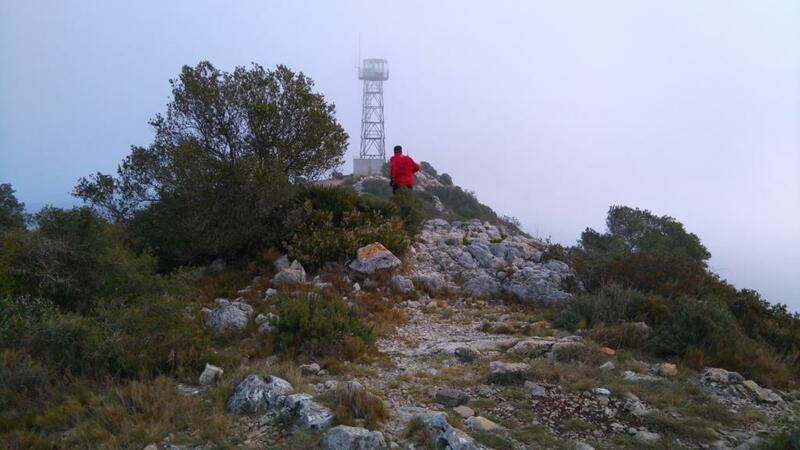 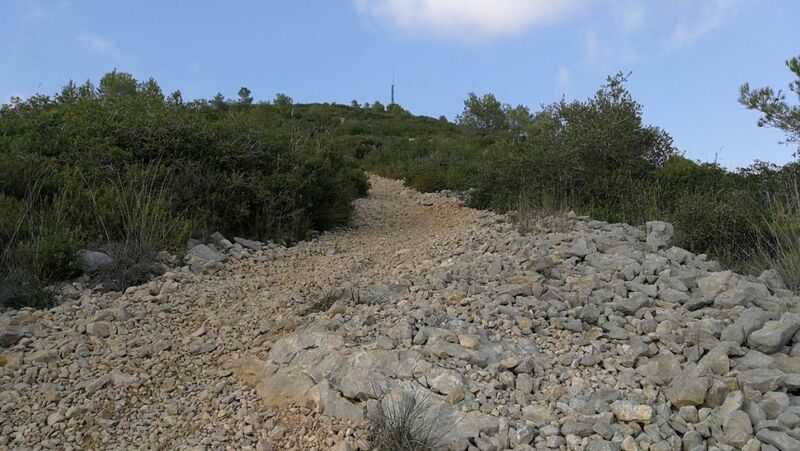 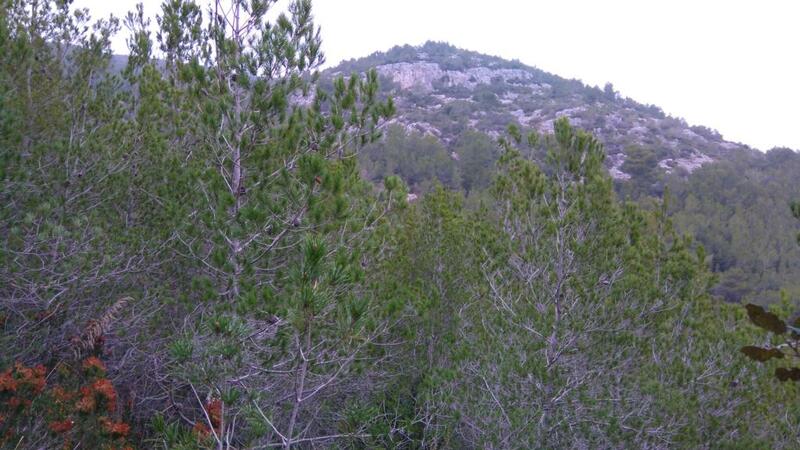 From there, follow an uphill path that will lead you to the summit of Pic de l’Àliga. Go across the summit until you find the next track. Follow the track that will take you to Coll de Daltmar, where you will find a chain. 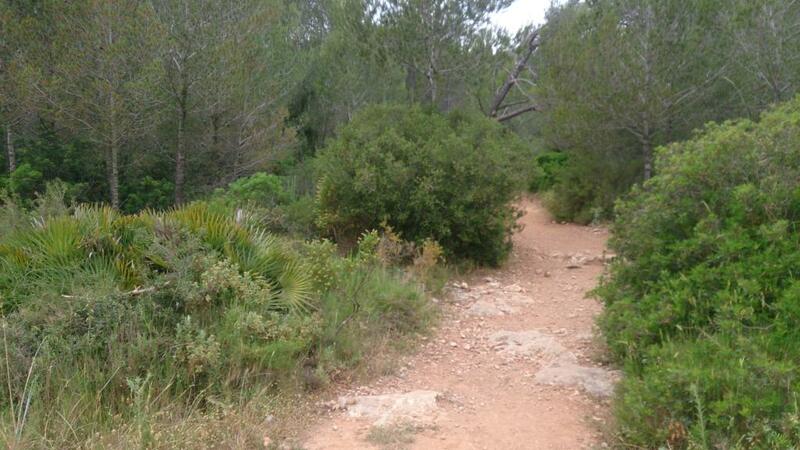 Pass through the chain and continue straight on gentle slope all the way to Coll Blanc. 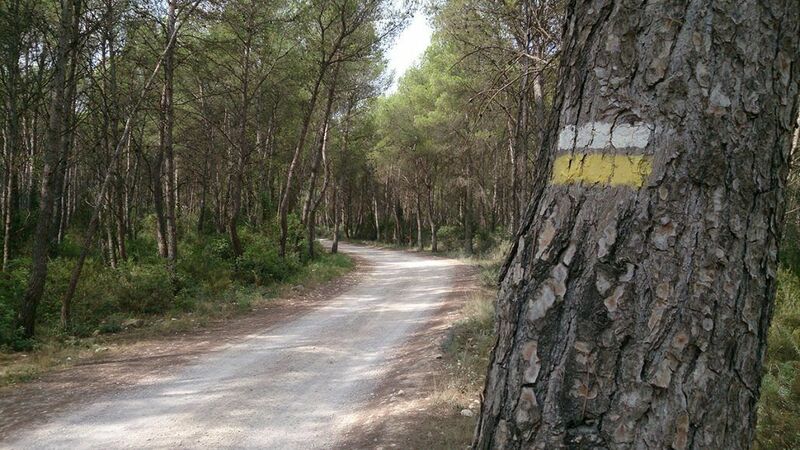 Once you get there, take a sharp turn to the left to face the next stretch, known as Fondo de Sant Joan. 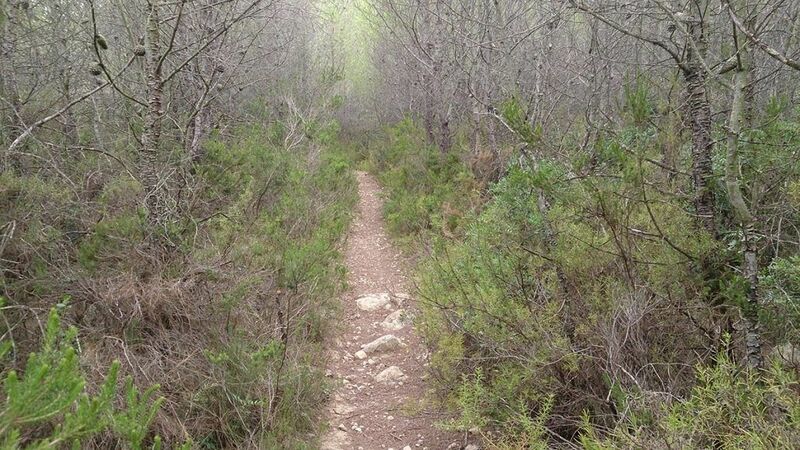 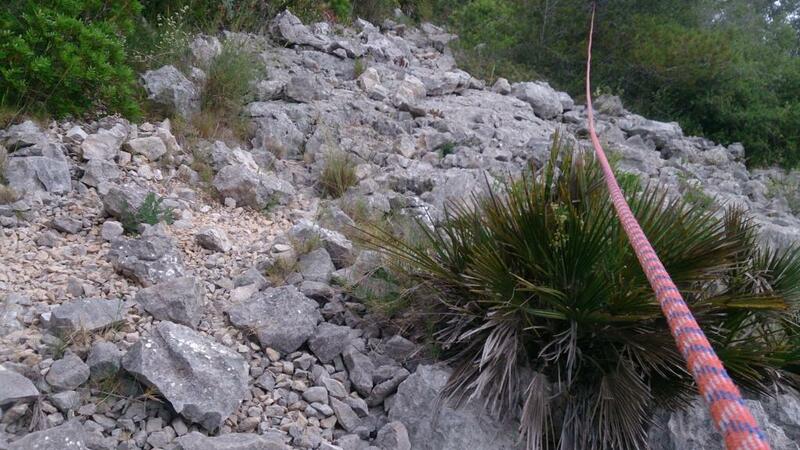 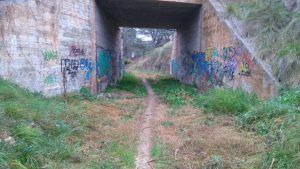 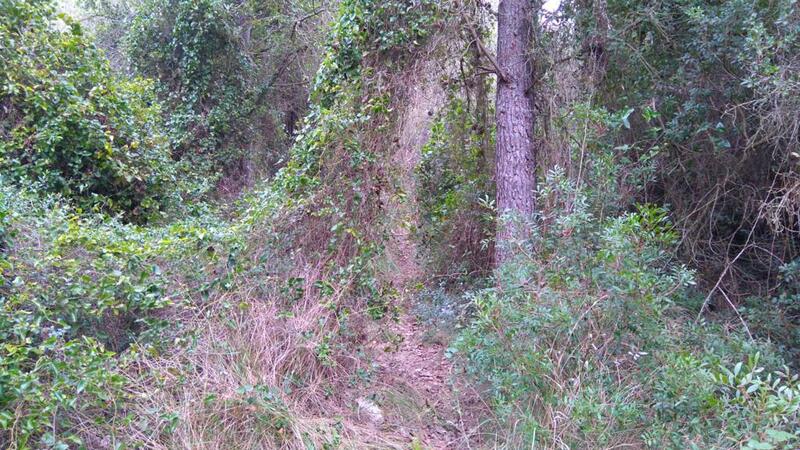 This is an entertaining trail that will test your reflexes on more than one occasion. 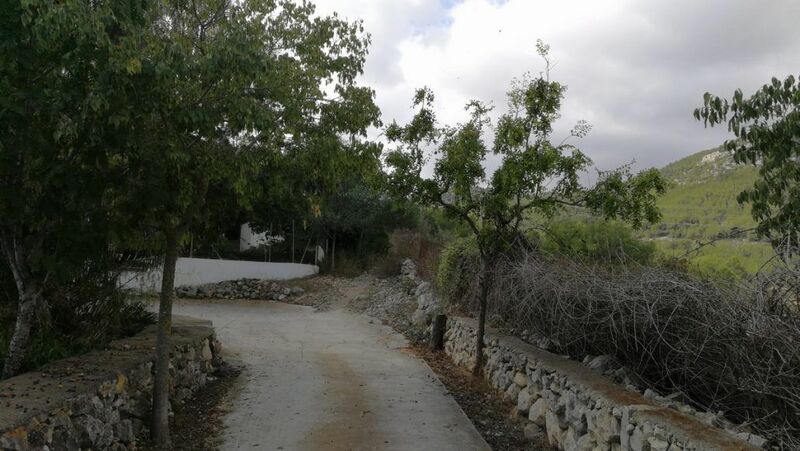 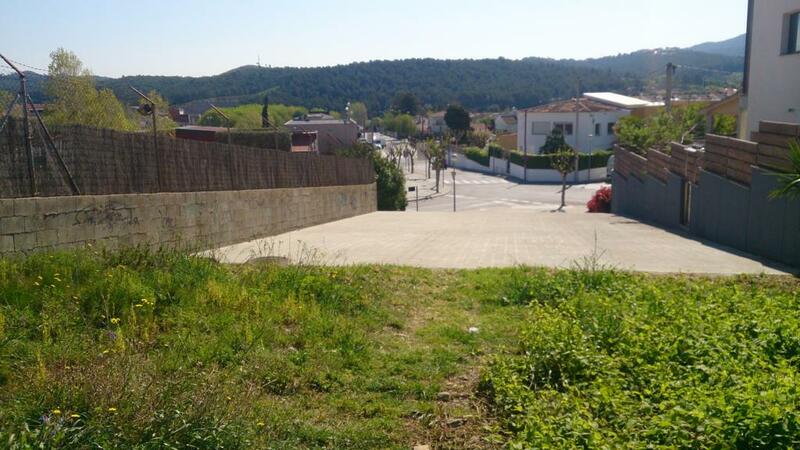 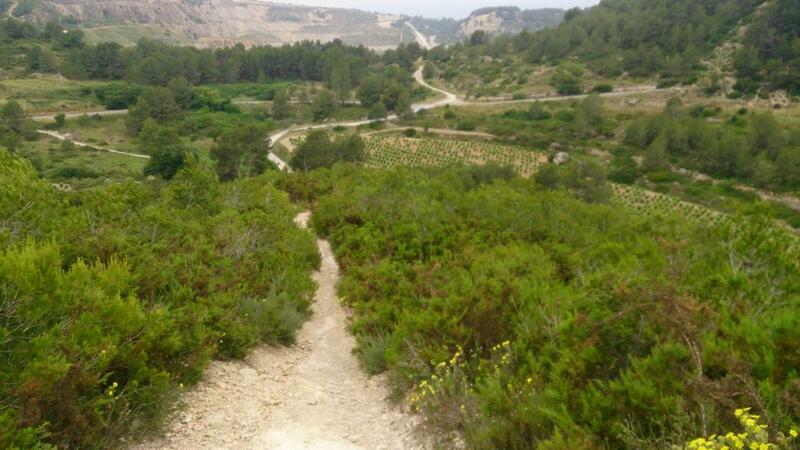 When you get to the end of that trail, turn to the left to continue by a track that will lead to Masía de Casa Alta. 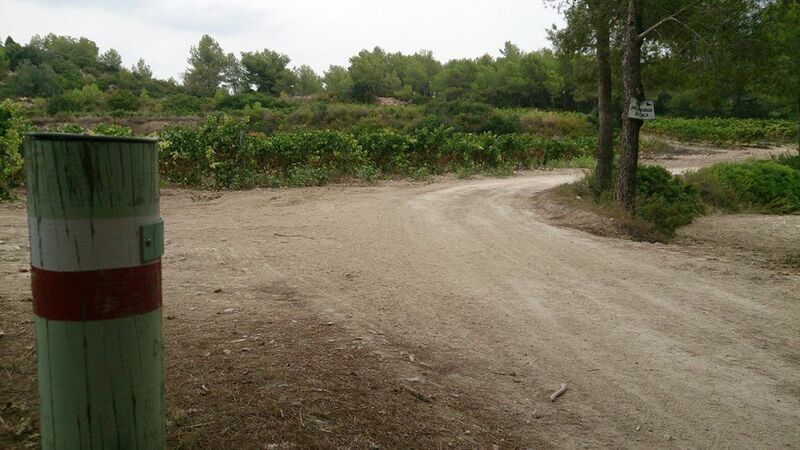 Go across the vineyard (placed in front of the farmhouse) and when you get to a track, follow it to the right. 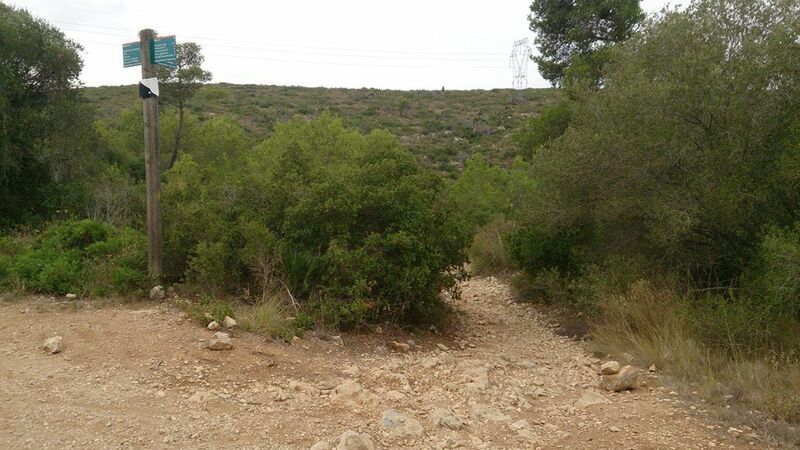 This following section is a long stretch that goes first, by flat terrain and then, on a gentle downhill. 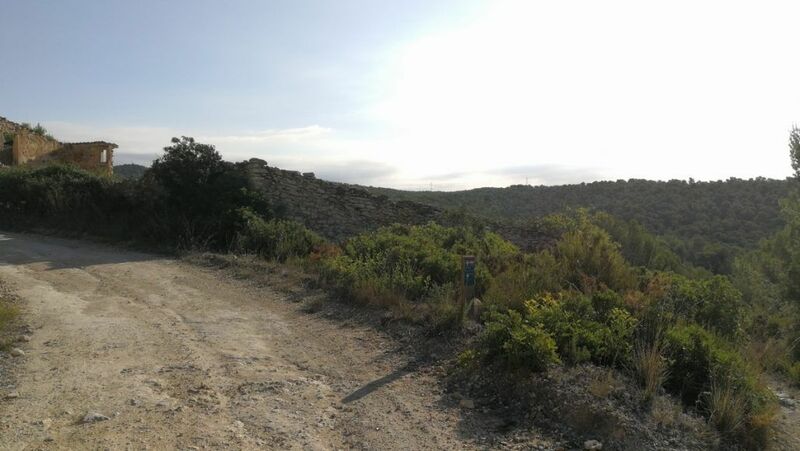 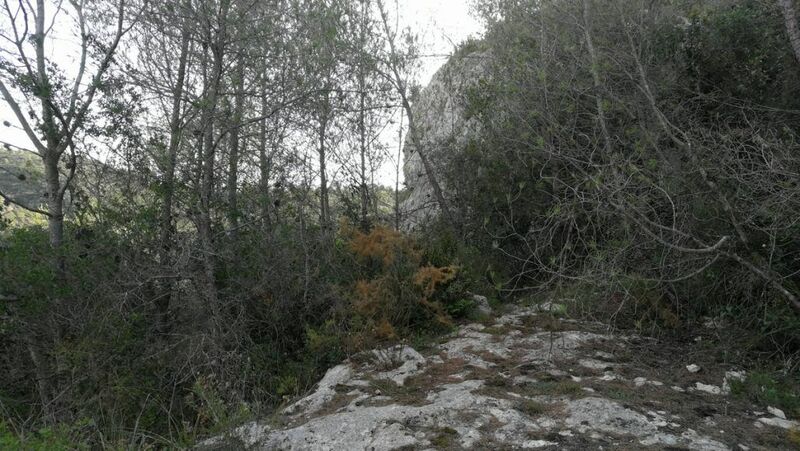 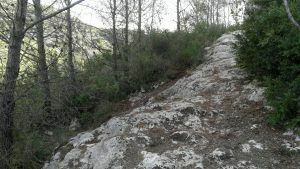 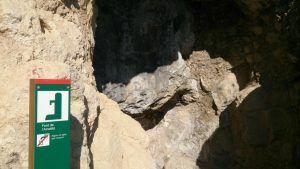 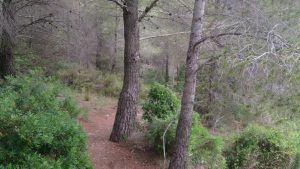 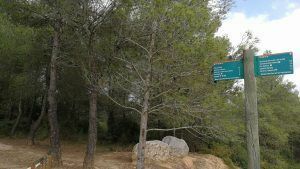 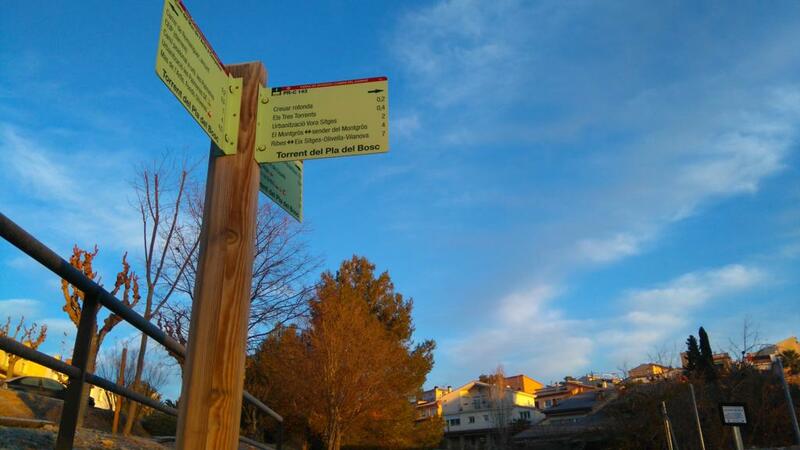 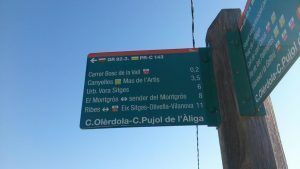 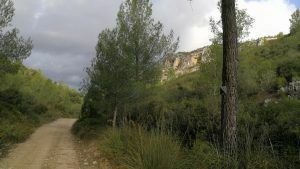 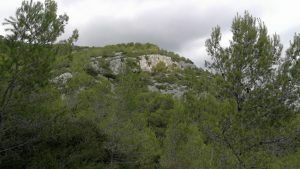 After walking a short uphill path, turn to the left and descend by a path that will bring you to the Torrent de la Garsosa, where you will find a sign-post. 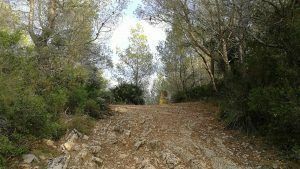 Keep moving by uphill paths till you get to Pla de les Palmeres. 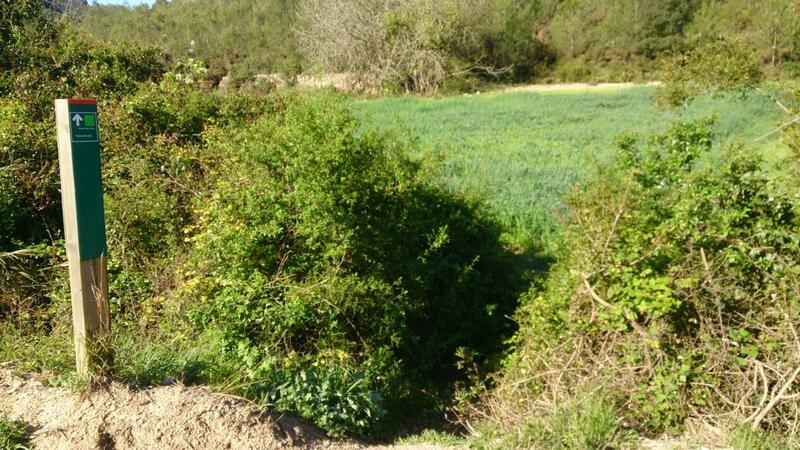 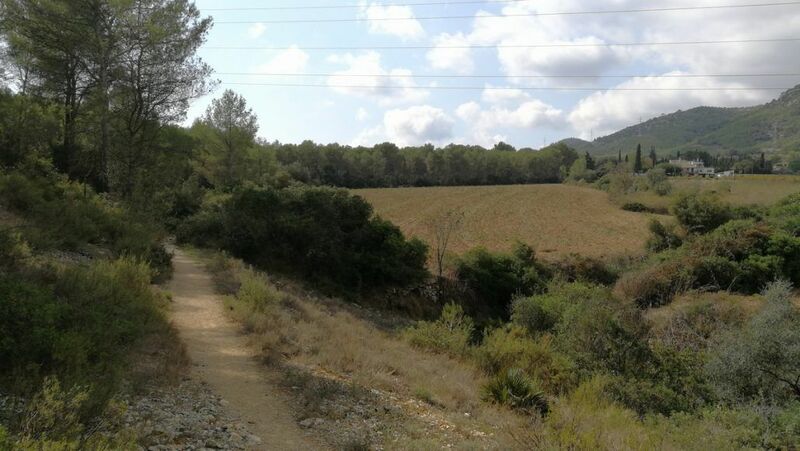 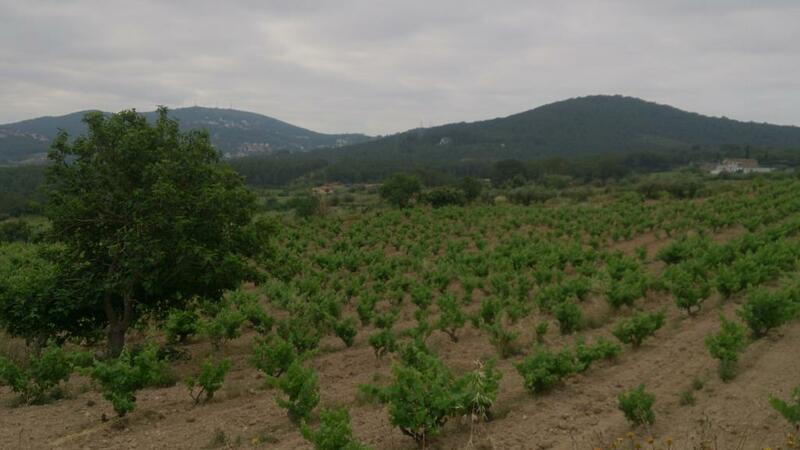 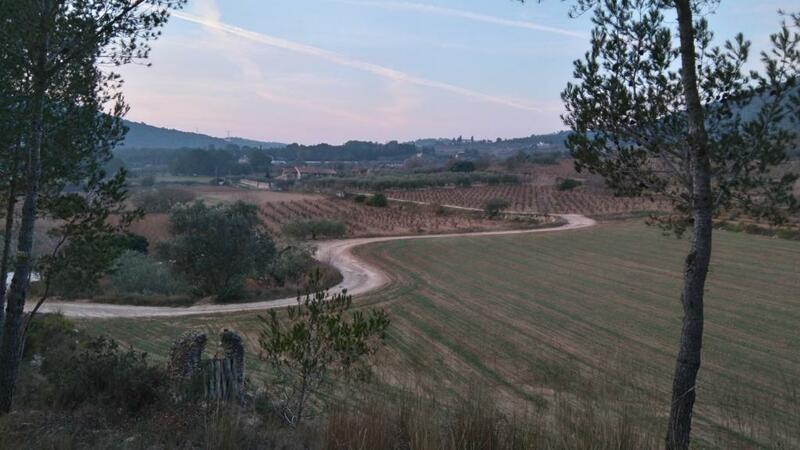 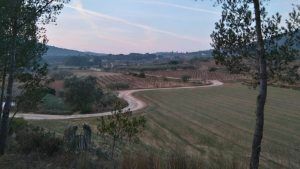 Go across this field and walk down a fun descent (Fondo de les Oliveres) along the stream. At the end of it, when you come across a vineyard, turn left and follow the trial that, on steep and long ascent, will lead you to a place with electric towers. 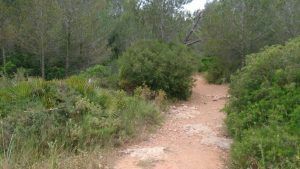 From there, turn left and descend for 200 meters on gentle slope till you find a path on your right, which is a bit hidden. 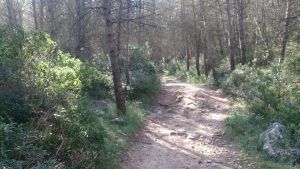 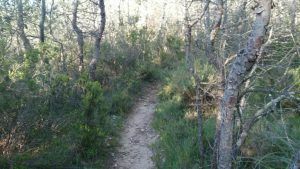 Follow this path that will head to Fondo del Teixidor. 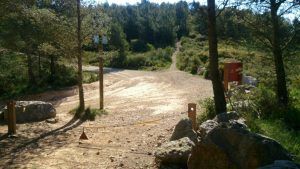 This is the most technical stretch of the circuit; be cautious when passing through the long slab of stone, specially if it’s wet. 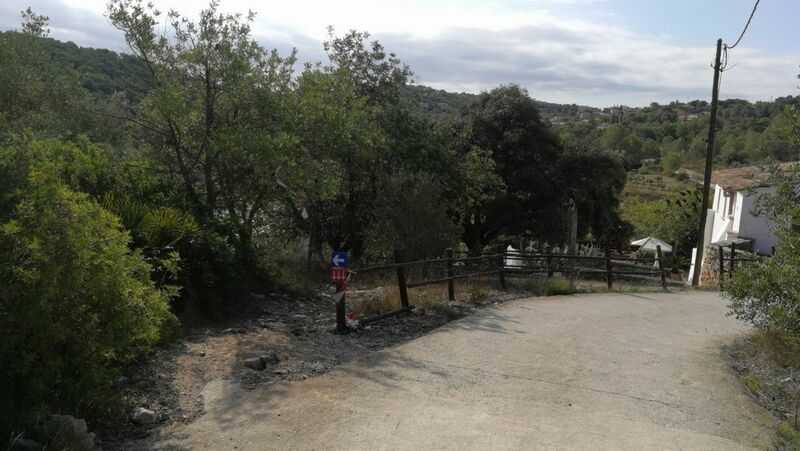 Once you are at the Fondo, turn right and start a gentle climb by path while enjoying the environment around. 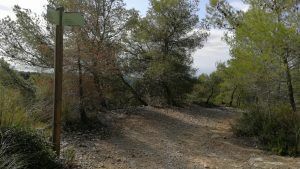 After going past a flatter section, at the end of the stream you will find the Coll de les Deus. 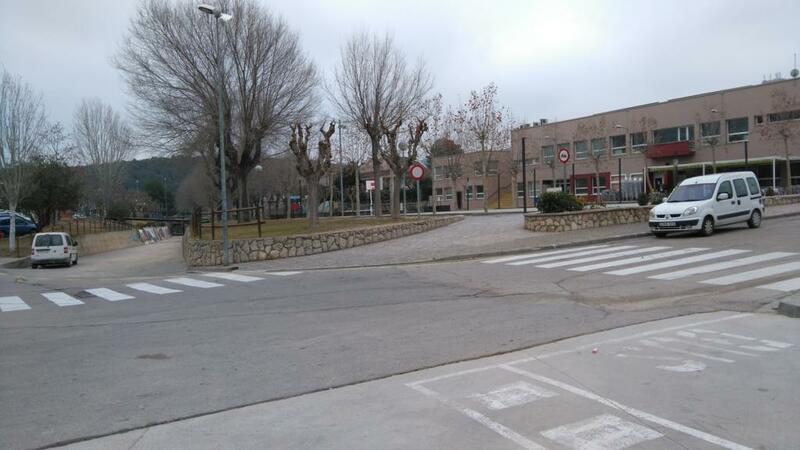 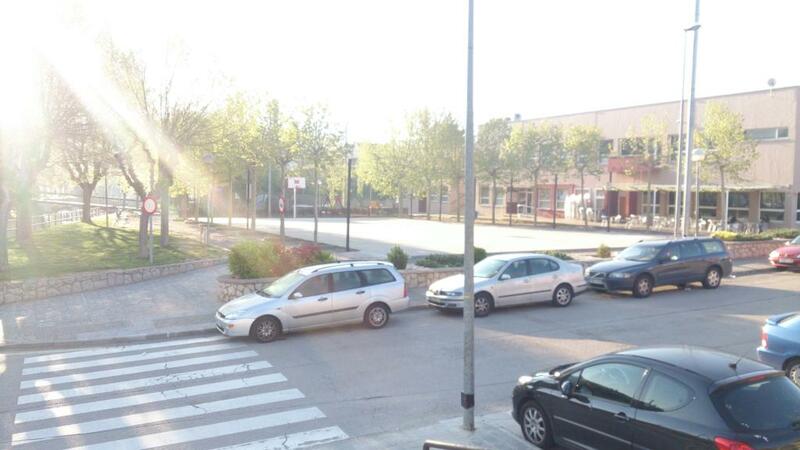 In this crossroads, take the path that ascends to the left and will lead to Turó de les Tres Partions. 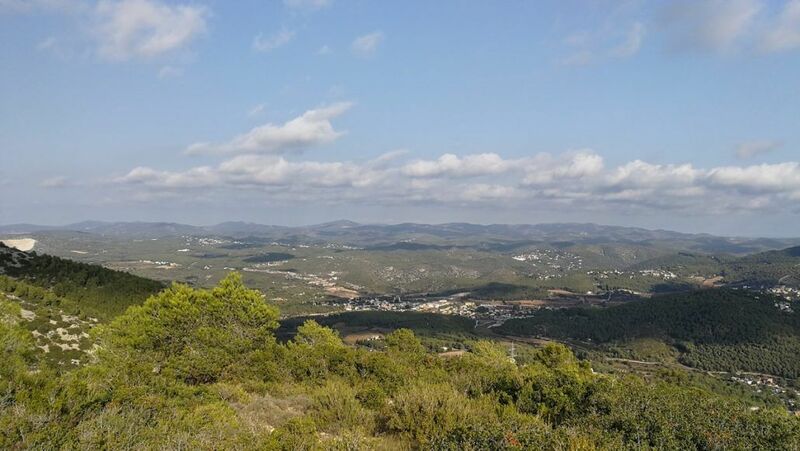 This is an spectacular lookout with great views of the central coastal region. Facing towards the Pic de l’Àliga, keep moving that way but this time with no need of reaching the summit. 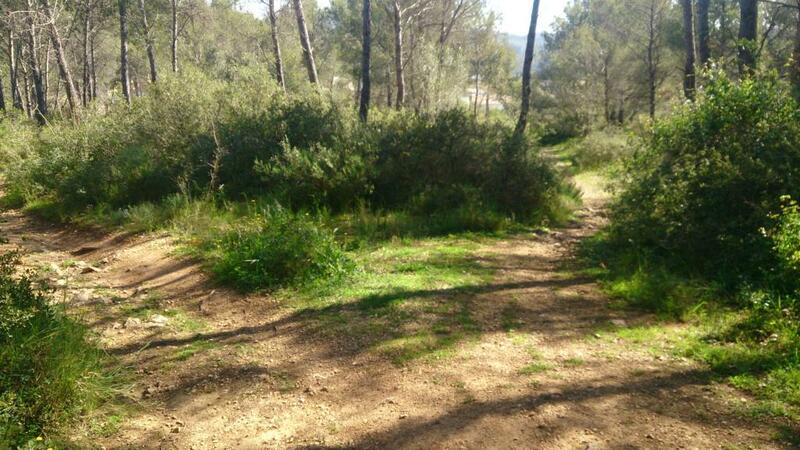 After crossing the field where the track ends, take the path on your right. 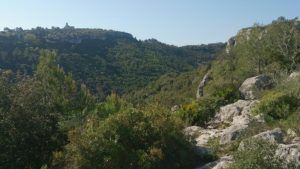 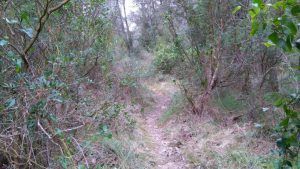 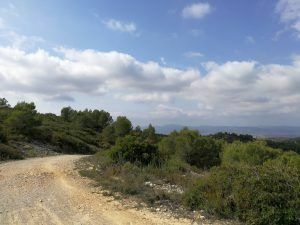 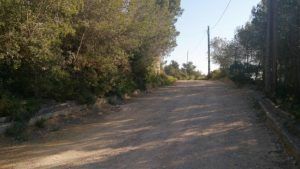 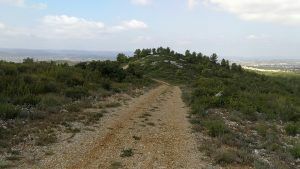 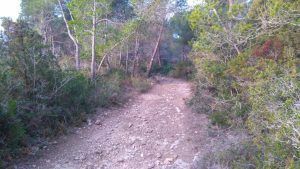 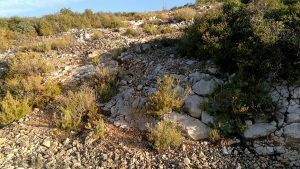 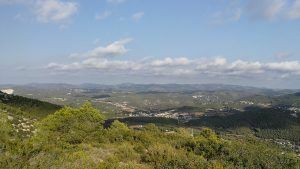 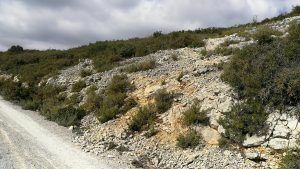 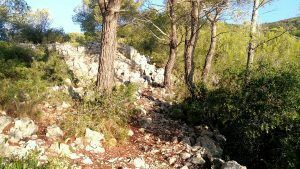 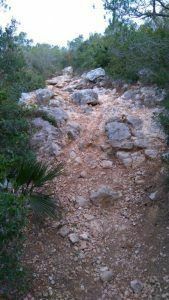 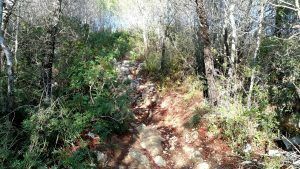 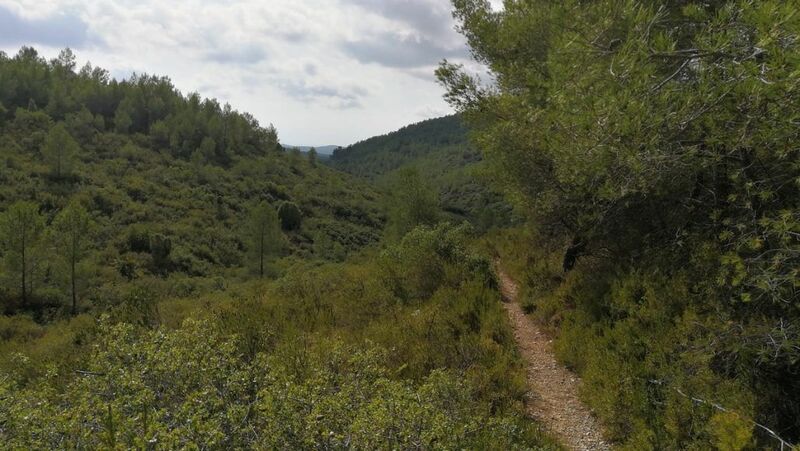 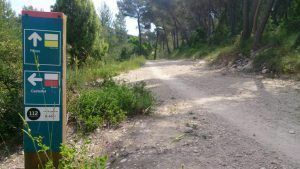 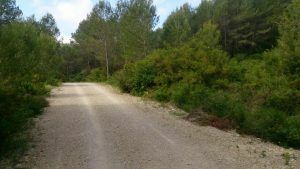 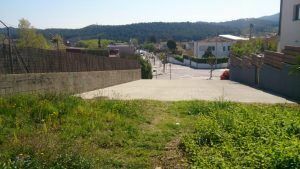 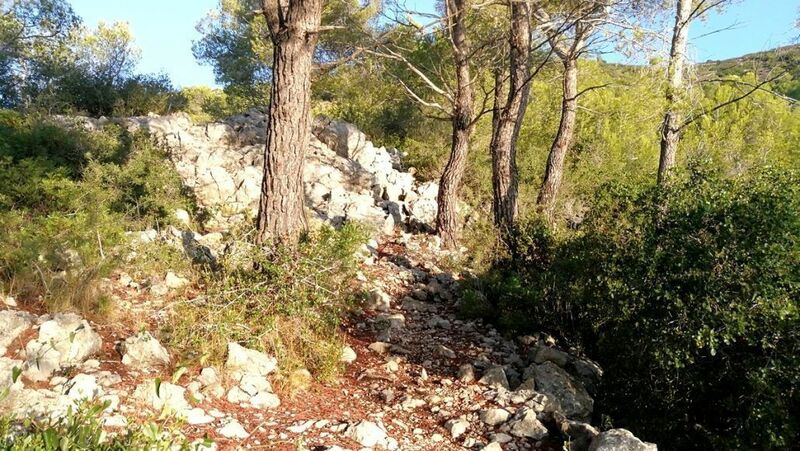 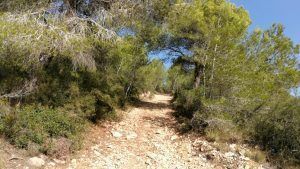 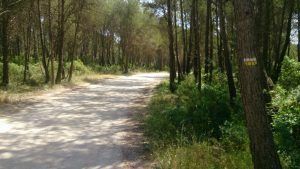 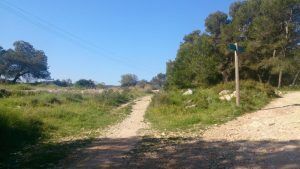 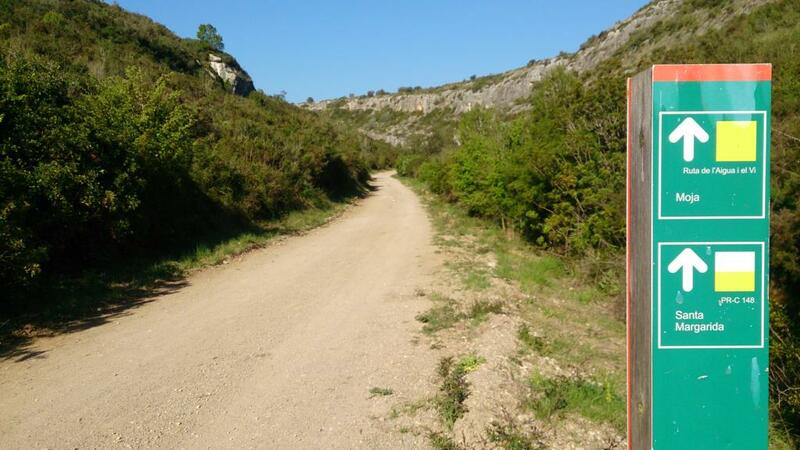 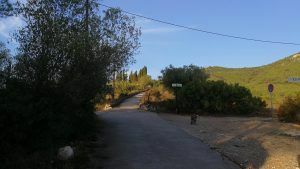 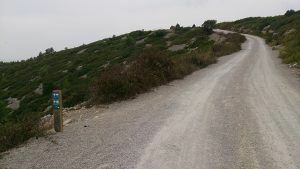 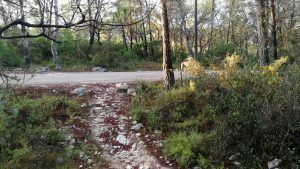 The first part of this section will be a bit technical, but the second half will be an easy to follow path that will bring you back to Canyelles. 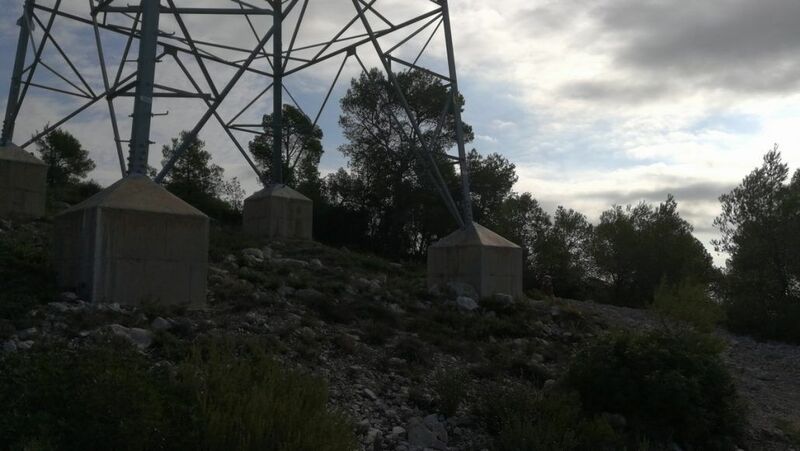 WATER: There is access to water in Canyelles. There is no access during the rest of the circuit. 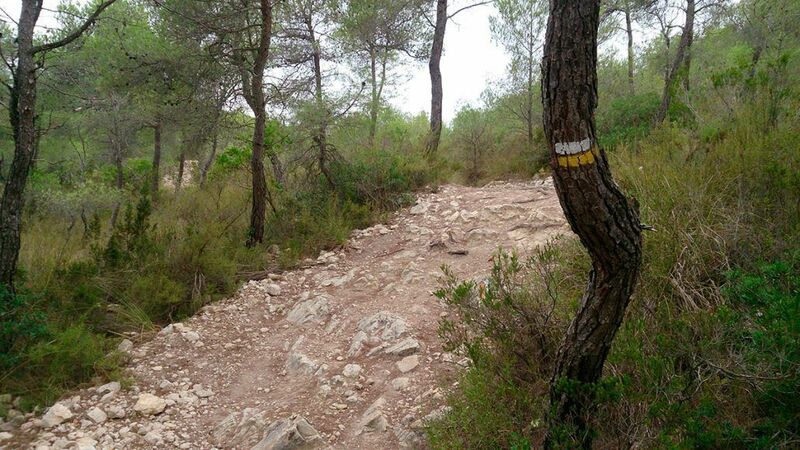 This circuit is divided into three distinct sections. 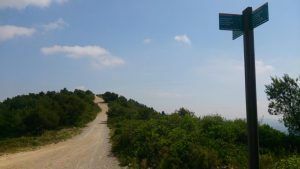 The first one is characterized by its easy to follow paths, with almost no gradient; on the second stretch you will complete the majority of the ascent (by paths and technical trials); the last section should be quite easy, going downhill most of the time. 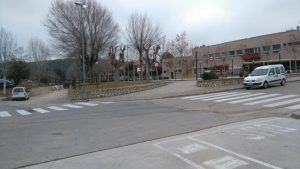 Starting from Plaça del Casal, go across the town until you turn right in the first street you find, passing in front of the ADF. 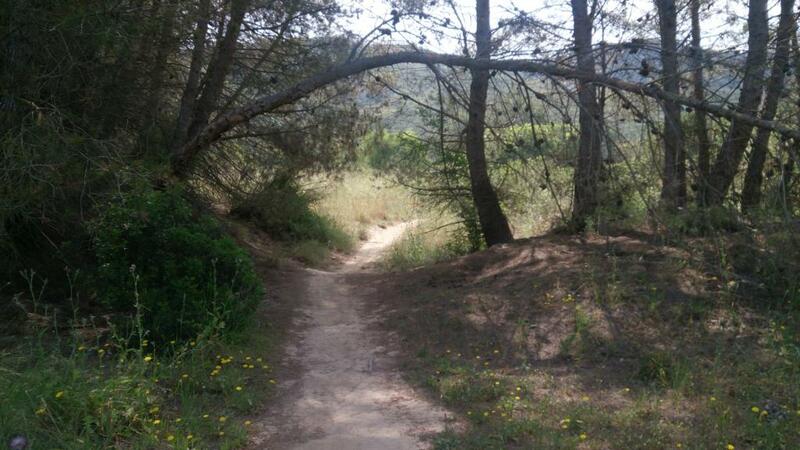 Leaving the paved ground behind, follow the wide path that gently ascends. 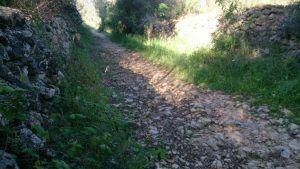 Keep moving through that path that eventually will narrow and, after a succession of turns and a short downhill, you will find a path that goes parallel a stream, just beneath Olérdola Castle. 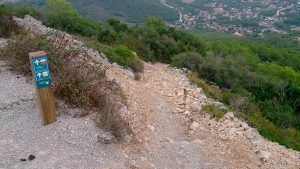 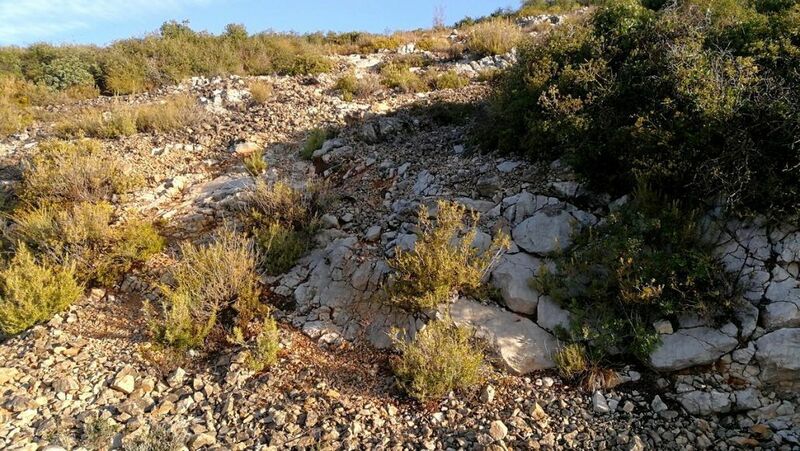 Walking on constant slope, you will come across a chain which is the entrance to a settlement. Cautiously go through the streets and cross Daltmar road. 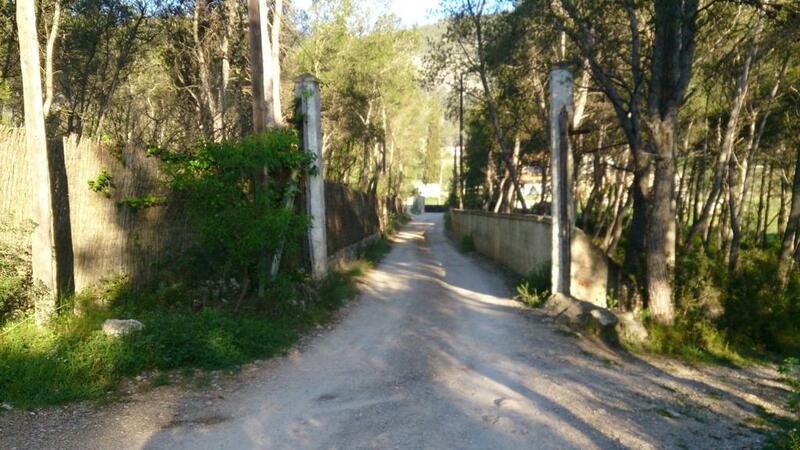 After that you will continue the route by several paths that will take you around some farmhouses. 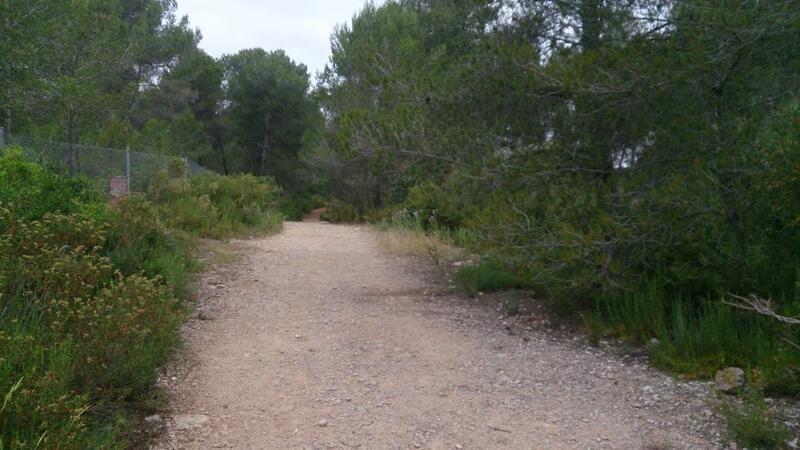 Those easy to follow paths will lead you to a small car park area, where you could see a sign-post. 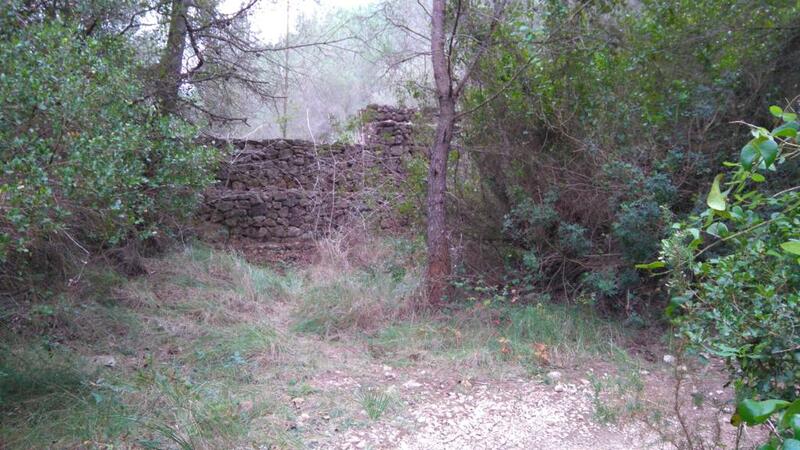 Turn right and follow a paved trail on gentle climb for 100 meters, till you reach a farmhouse. 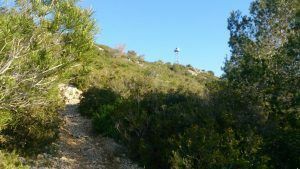 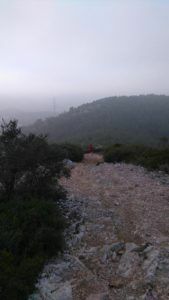 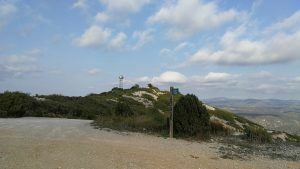 Just beside it you will find a path that relentlessly will take you to Pic de l’Àliga, the highest peak of this circuit. 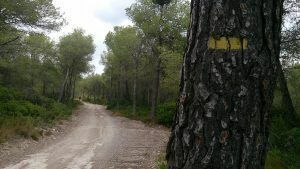 To start the descent, there is a short stretch by track that will lead to Turó de les Tres Partions. 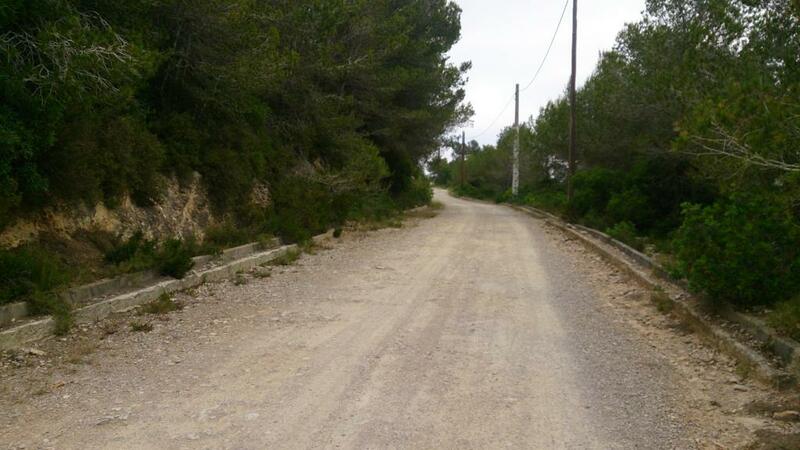 Keep descending through a technical rocky trial that heads to Coll de les deus. 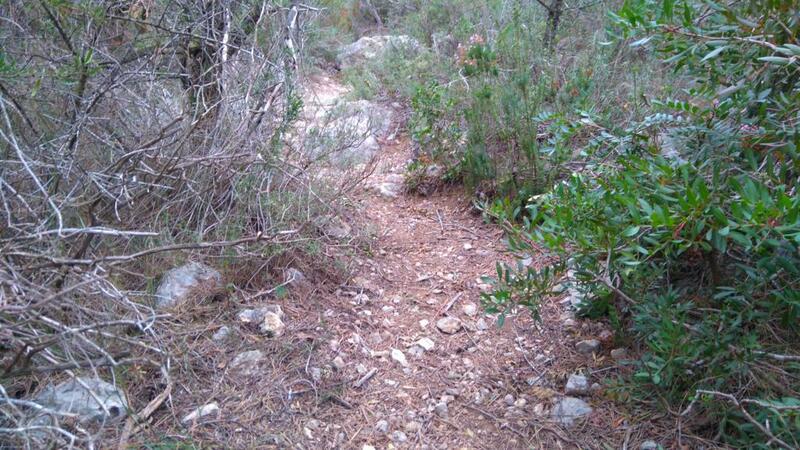 From there, continue straight and you will have to pass some tricky parts where you might need to use your hands. Continue the descent, passing through the Fondo de los olivos. 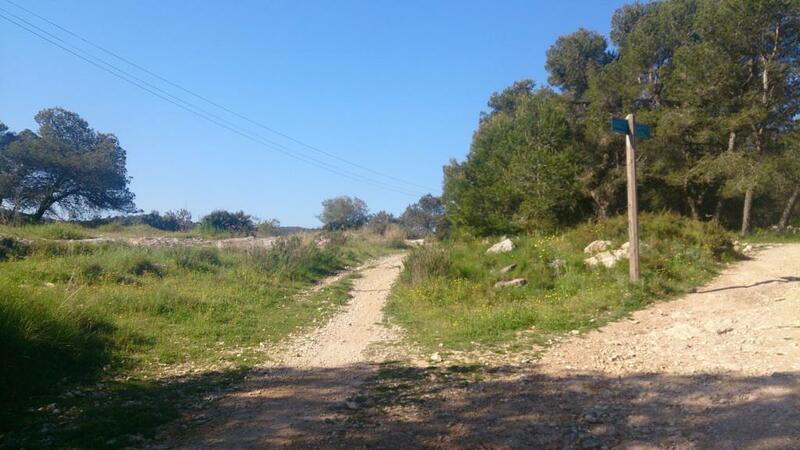 At the end of this, turn right and follow the slope that steeply rises. 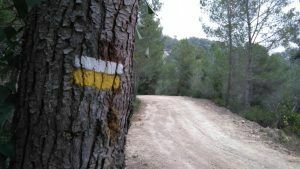 Walk that way for around 4 kilometers; section full of twisty paths, with some technical parts and steep climbs. 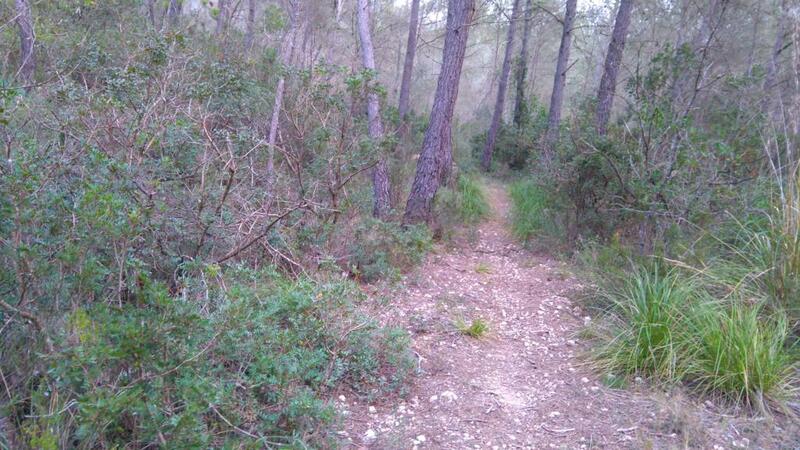 After all of that, turn right and you will get into a leafy path that will take you quickly to a forest track. 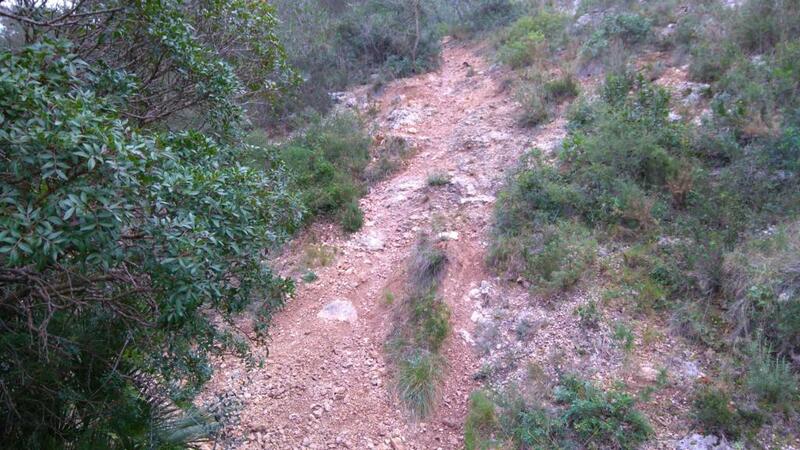 When you get to the end of this easy to follow track, there is a short but intense climb, the last one in the route. 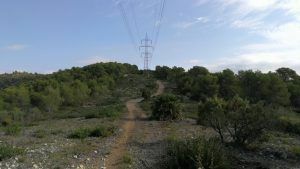 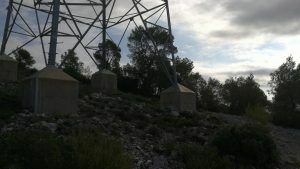 It will take you to a field with an electric tower and, shortly after, you will be descending by a succession of paths and short tracks, heading back to the starting point in Canyelles. 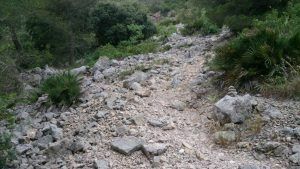 WATER: There is access to water in Canyelles. 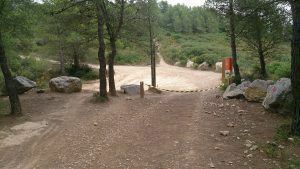 There is no access during the rest of the circuit. In case of emergency, you will pass by some farmhouses. 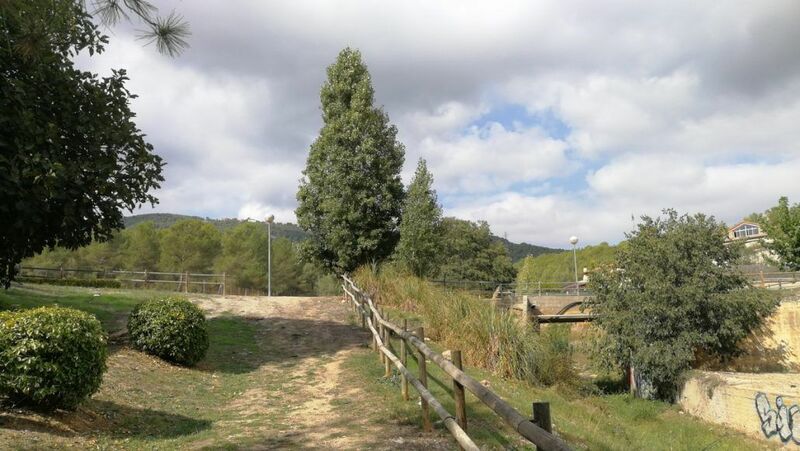 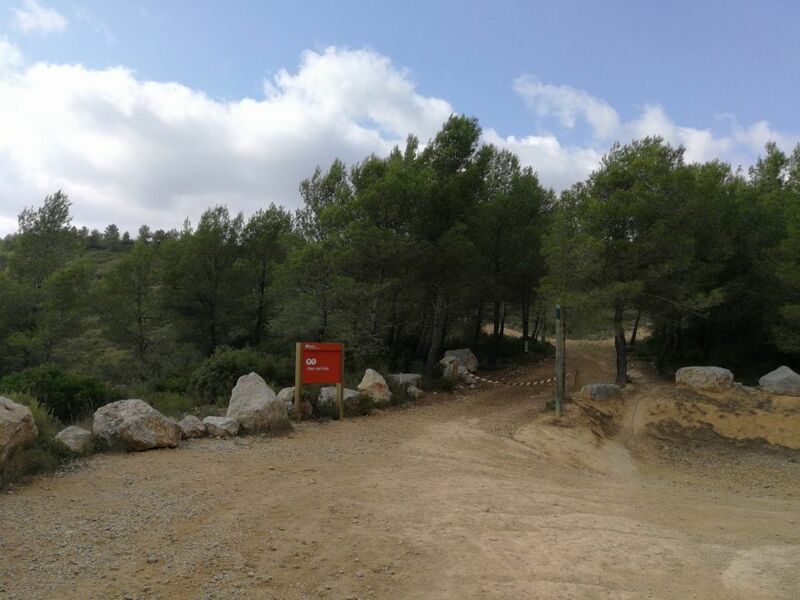 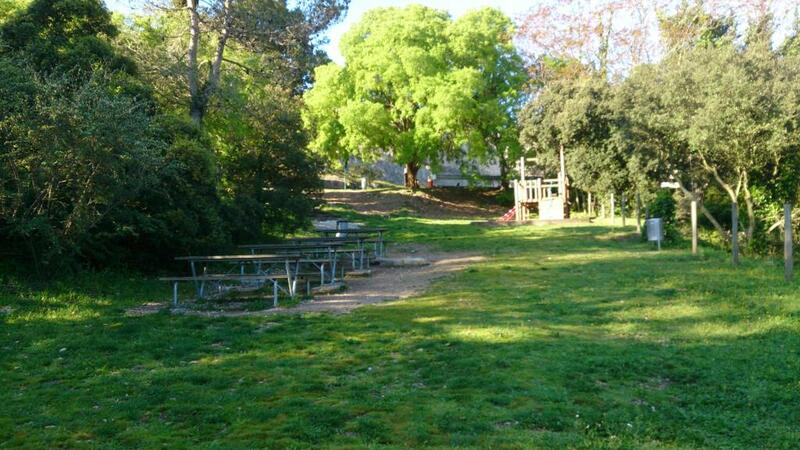 This is an enjoyable trail that will take you around charming hideouts in Parque de Olèrdola. 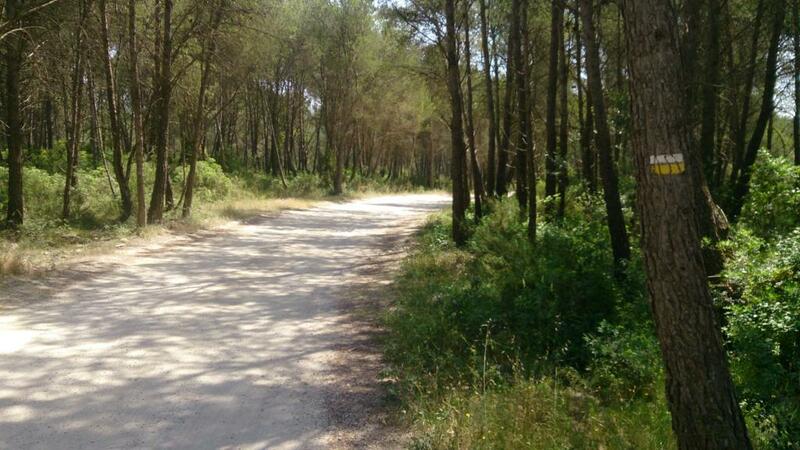 Even though this is a shady circuit, it is advisable to avoid the central hours of the day during summer. 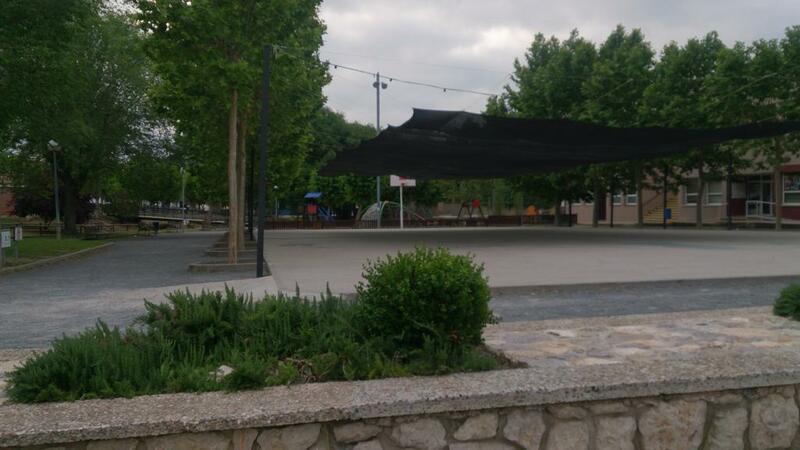 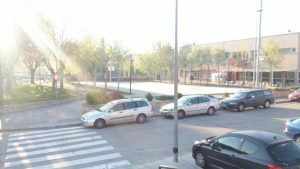 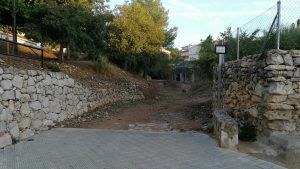 Starting from Plaza del Casal, walk along the torrent and carefully cross the street that leads towards a group of houses. 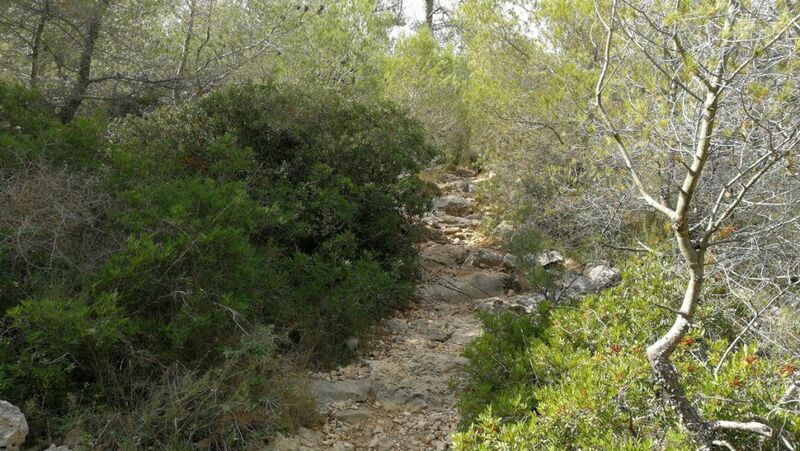 Continues by a narrow path that gently ascends, in parallel to the stream. After doing some stretches by wide track, you should reach the car park area of “La Facu”. 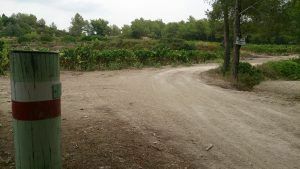 Turn right and follow a path that is paved just for the first few meters. This gentle climb, that gradually will become more steep, will lead you to the highest point of the route: Pico del Águila. From this marvellous lookout you could see the Catalan coast, the inland region and even the Pyrenees in clear days. 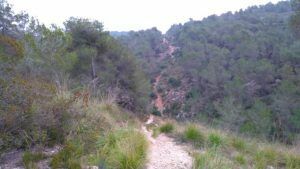 The descend from the summit will be done by a narrow and technical path that will lead you straight to Coll de la Peña del Escofet. 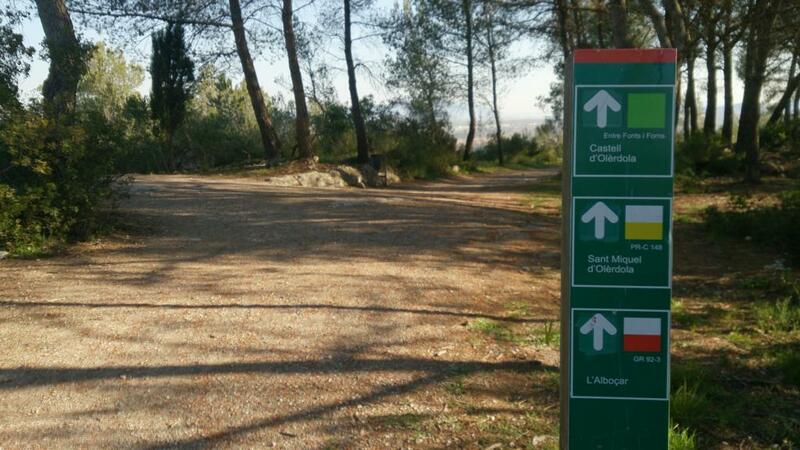 From there, follow downhill a wide track until you come across a sign at the entrance of Parque de Olèrdola. 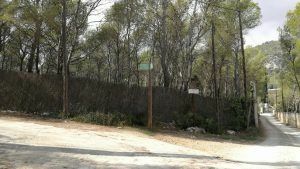 Go past the chain that stops the access to vehicles and continue by the wide path that heads to the necropolis of Plan de los Albats and to the Castle monumental ensemble. 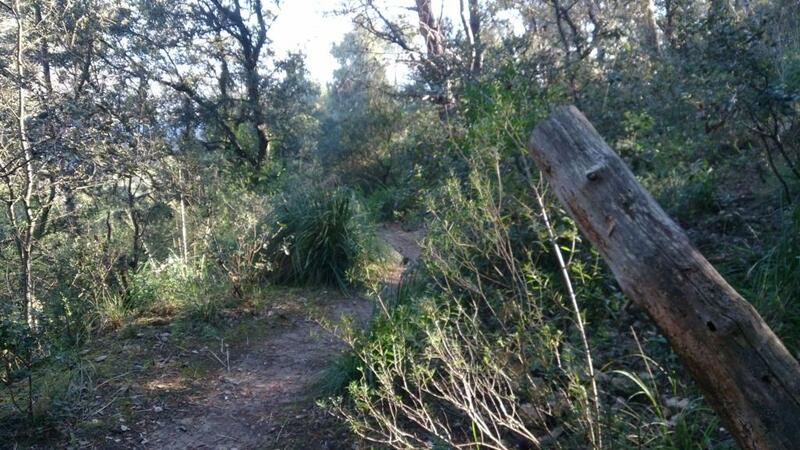 From the picnic area, walk down the staircase until you find the road. 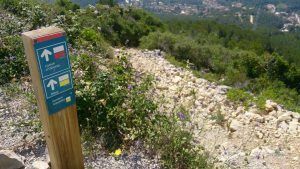 Walk that way for 50 meters downhill and turn left to follow a path that will lead you to Fuente de Fontanilles (untreated water). Shortly after you will see a track that goes along the “Fondo del Valle”. 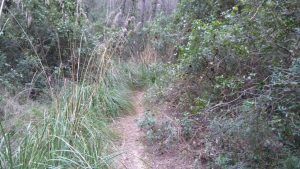 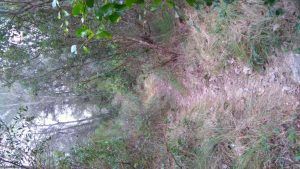 It will take you to the left on a slight incline that must be followed until you find a path on your right (it is a bit hidden). This path will take you first across a crop and then it rises on a steep slope that heads to Fuente del Ametllor. 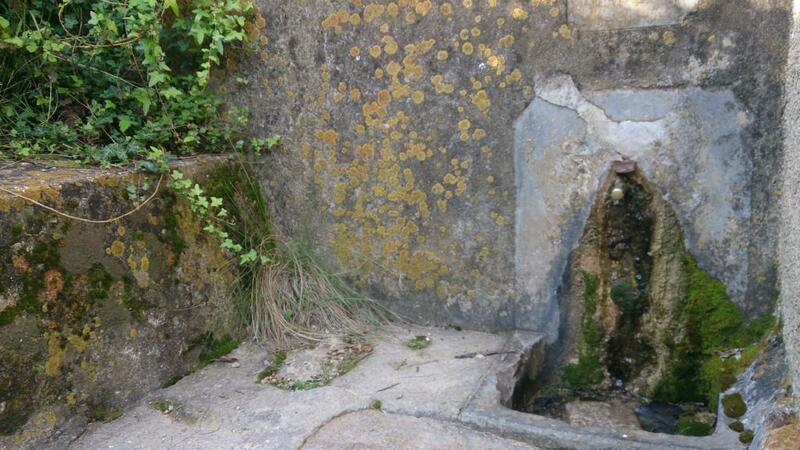 Leaving this fountain behind, continue ascending until you reach the crags. Once you are standing on a wide slab, turn left and keep moving parallel to the crags, while admiring the amazing views over Olèrdola Castle. Following the path, you will eventually get to a crossing. 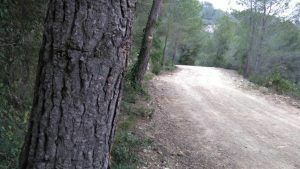 Turn left and, after passing across a chain, you will come to a road that should be cautiously walked for 100 meters downhill. 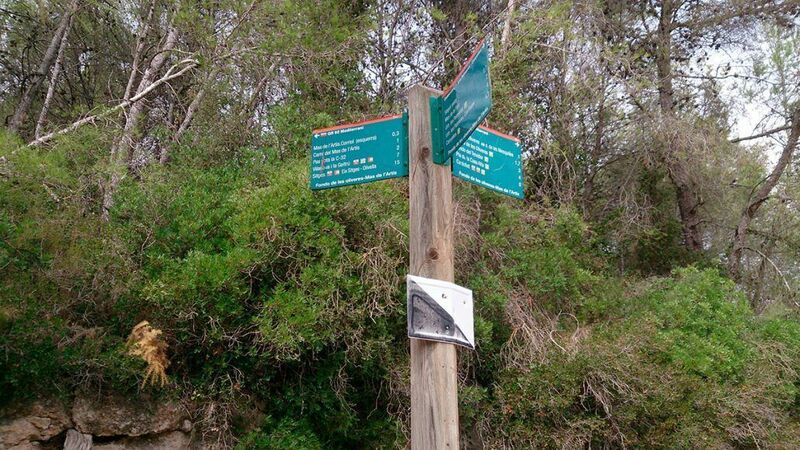 When you find a park sign on your left, take a wide path just on your right. 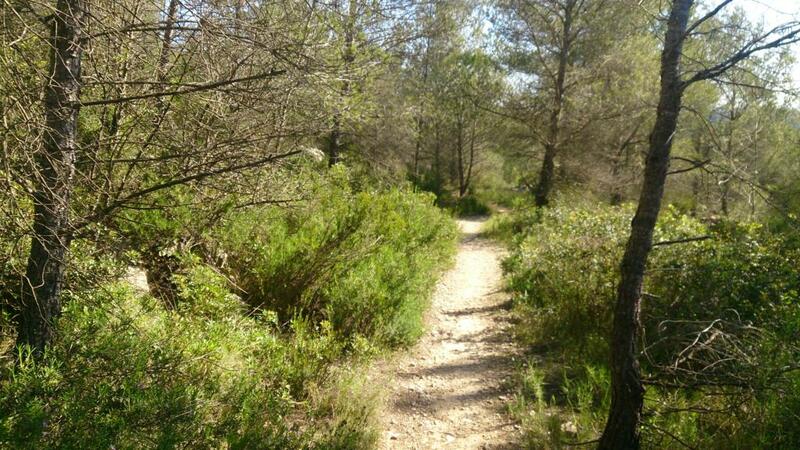 Continue the circuit through a succession of trails that will take you to Coll Blanc. From there, turn left and follow the track that goes along the crest and towards Collet de Daltmar. 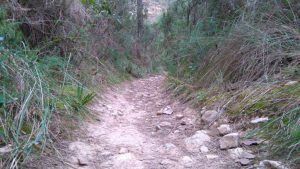 The next stretch consists of a path that steeply ascends, followed by a track that will take you to the a field in Pico del Águila. 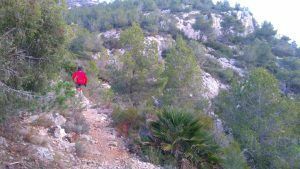 Without reaching the summit of this peak, start descending along the technical path that will bring you back to “La Facu” car park. To finish the descent, there is a short stretch by path that will take you back to Canyelles. 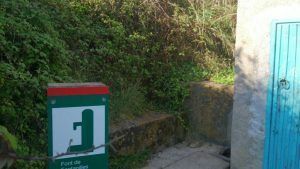 WATER: There is access to water in Canyelles. 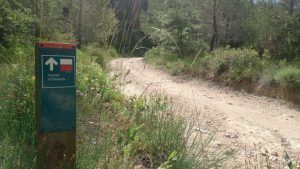 The route passes by Fuente de Fontanilles (km 10) and Fuente del Ametllor (km 11). 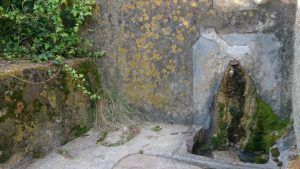 Make sure you bring water treatment tablets and bear in mind that these fountains might be dried in summer. 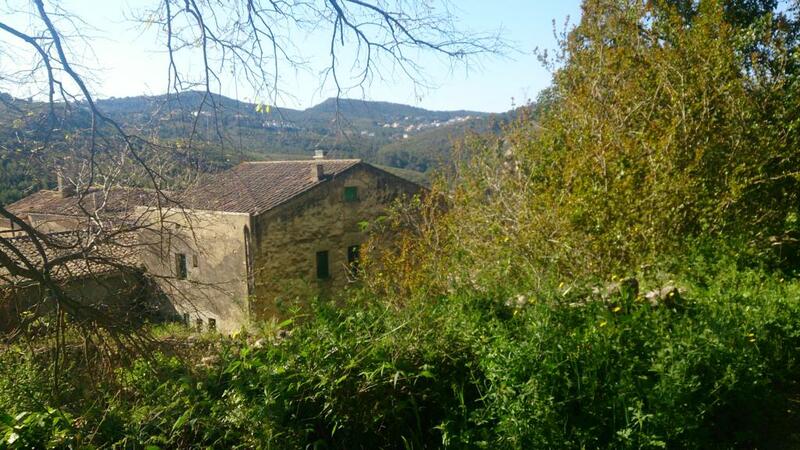 TOURISM: Canyelles; historical farmhouses; Olérdola Castle. 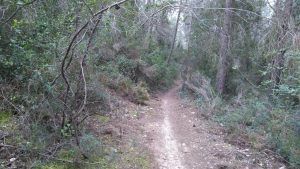 The circuit mainly runs through forest track and wide paths. 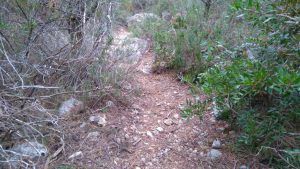 It is the perfect trail if you are looking for a constant training rhythm with progressive up and down slopes. 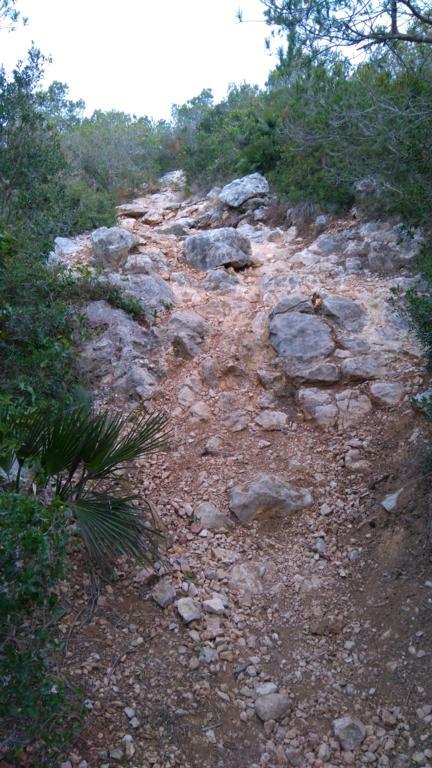 There is no access to water at any point in the trail. 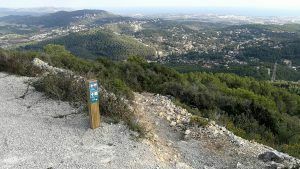 Starting from Plaça del Casal, continue by a good going and wide track towards Urbanización Les Palmeres. 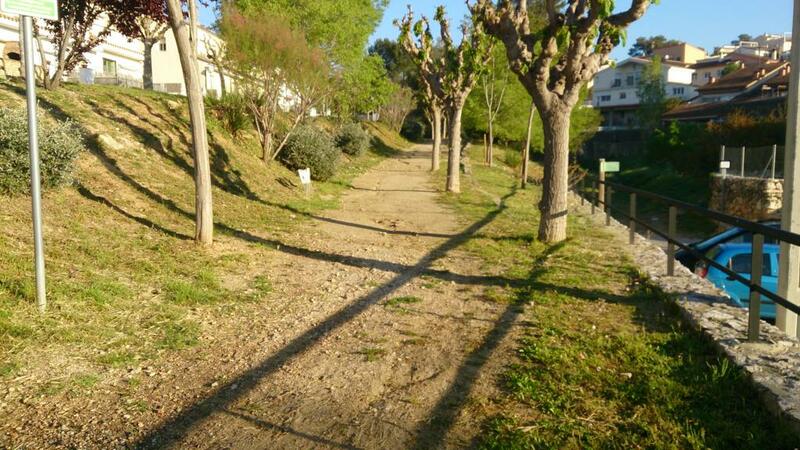 From there, follow a paved stretch and, after a dirt path, you will find the Mas Artís. 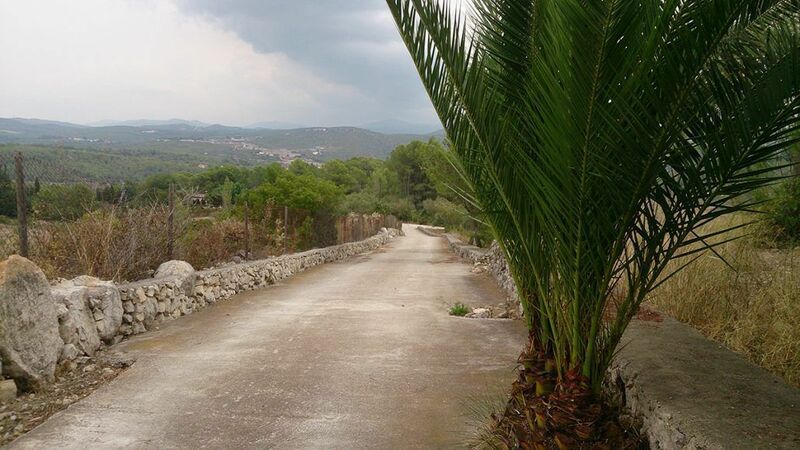 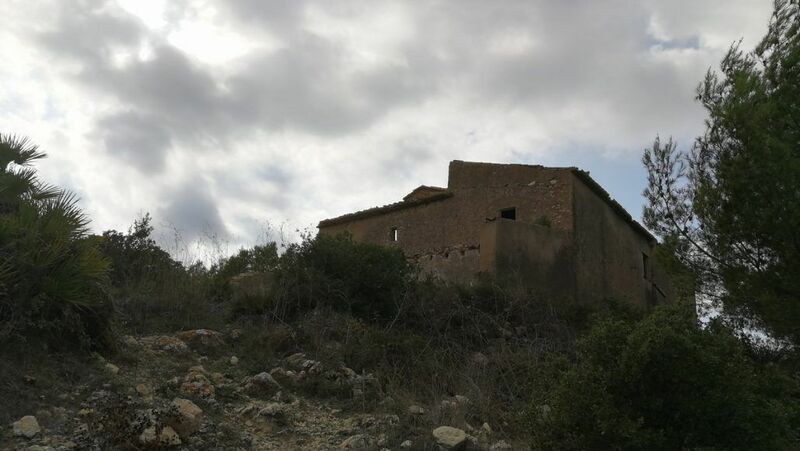 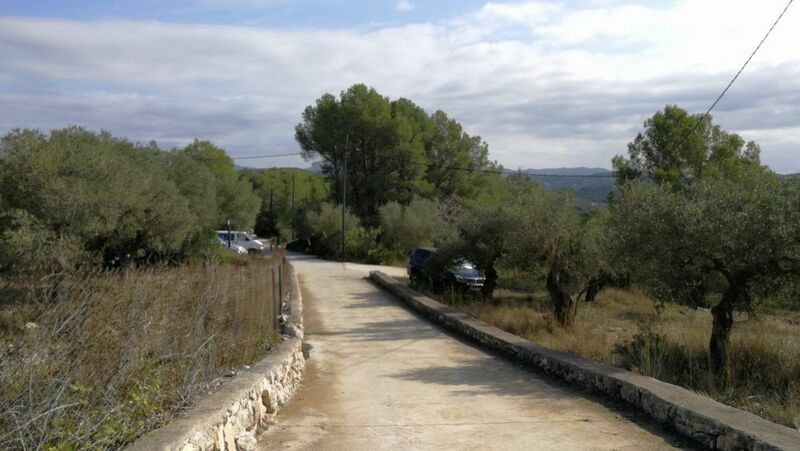 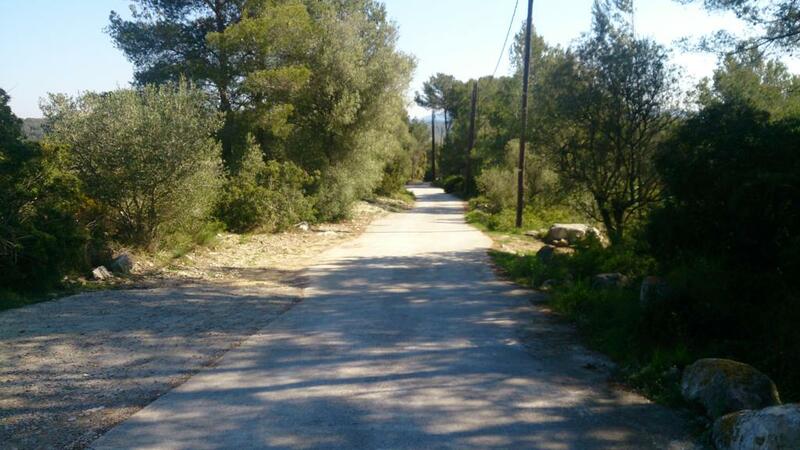 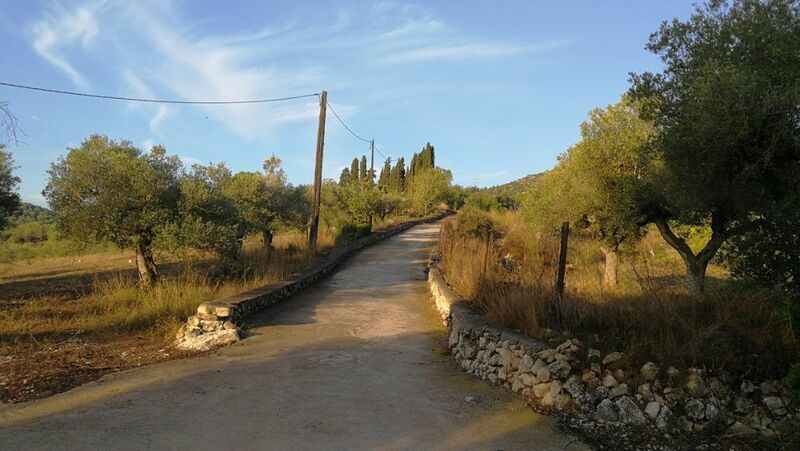 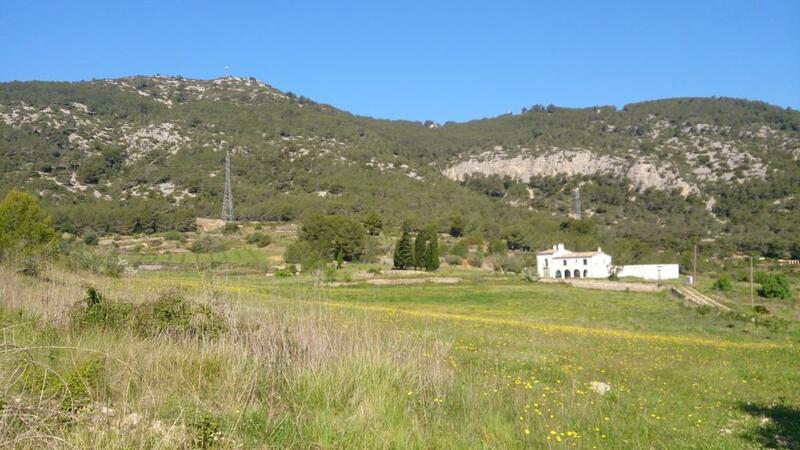 Go past the farmhouse and follow the track until you meet the Pla de les Palmeres. 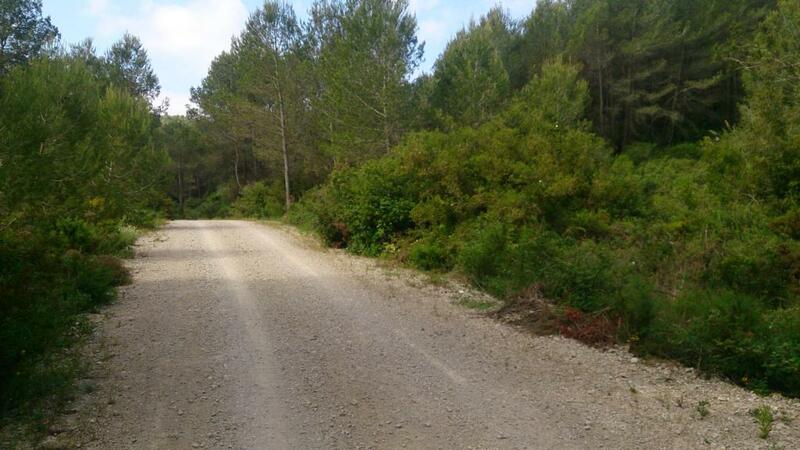 From there, you will descend through the Fondo de la Gargosa, one of the few technical sections of this route. 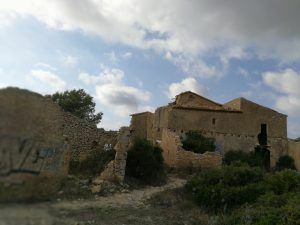 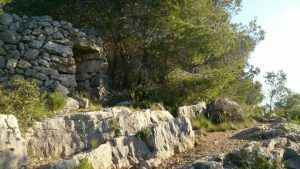 By a rocky path you will come across a wide forest track that will take you through a succession of up and down slopes, passing by some old farmhouses in ruins. At the end of this stretch you will reach the Coll de Daltmar. 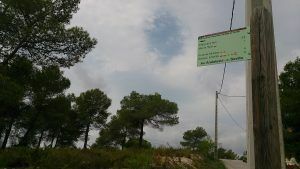 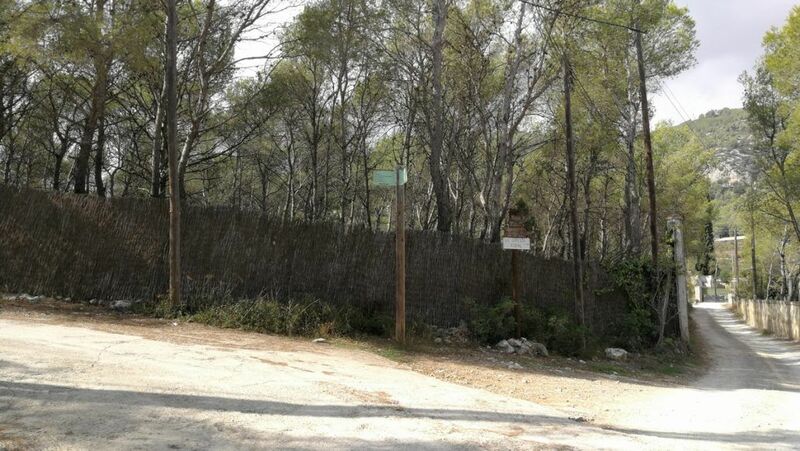 l’Àliga, you will find a sign-post and a path on your left. 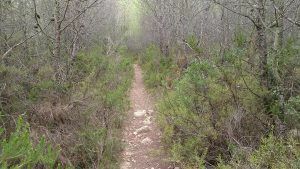 Follow that path and, after a technical short stretch, follow the track that will get you back to the starting point. 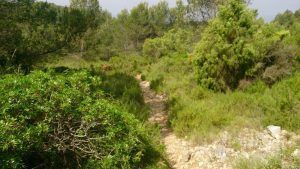 WATER: All needed water facilities in Canyelles. 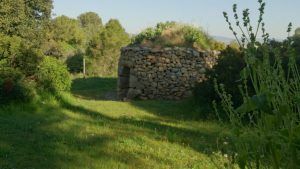 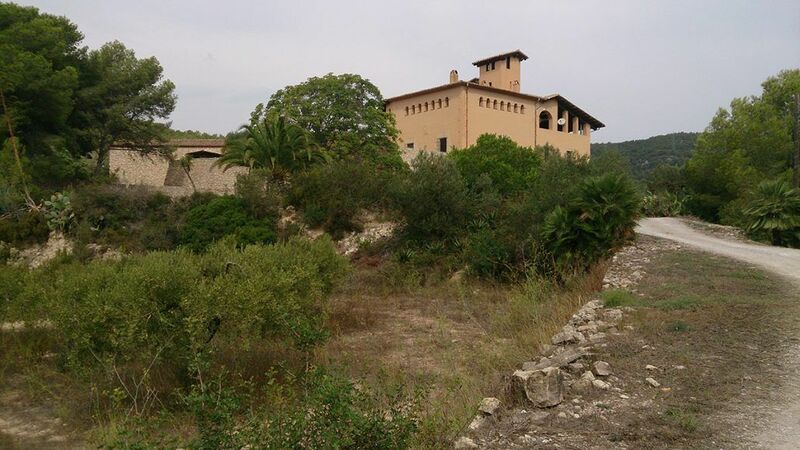 TOURISM: Canyelles; historical farmhouses (Casa Alta, Can Casanyes, Can Balaguer). 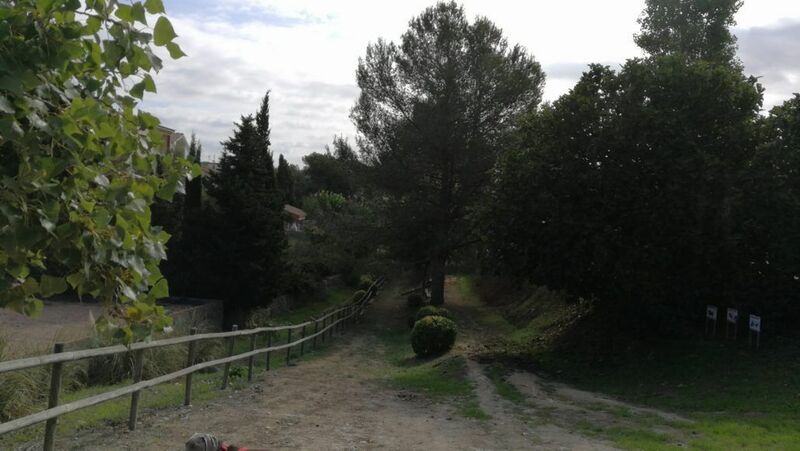 The circuit starts from the centre of Canyelles, moving along the stream that goes across the village. 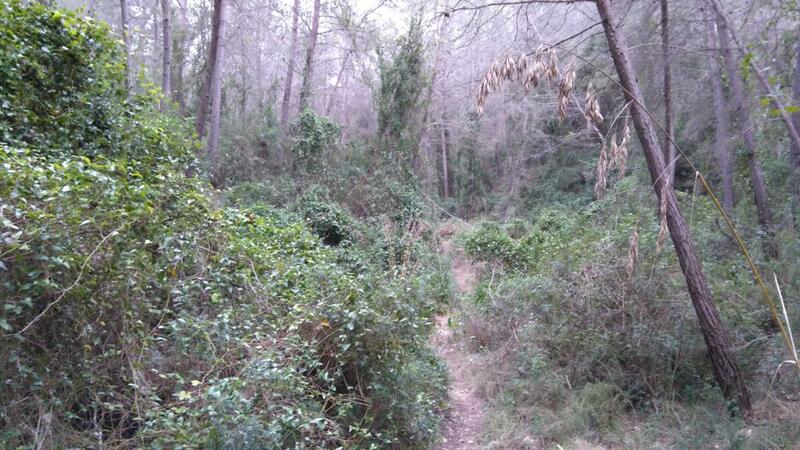 Shortly after, by path, you will get into the forest. 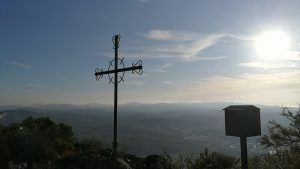 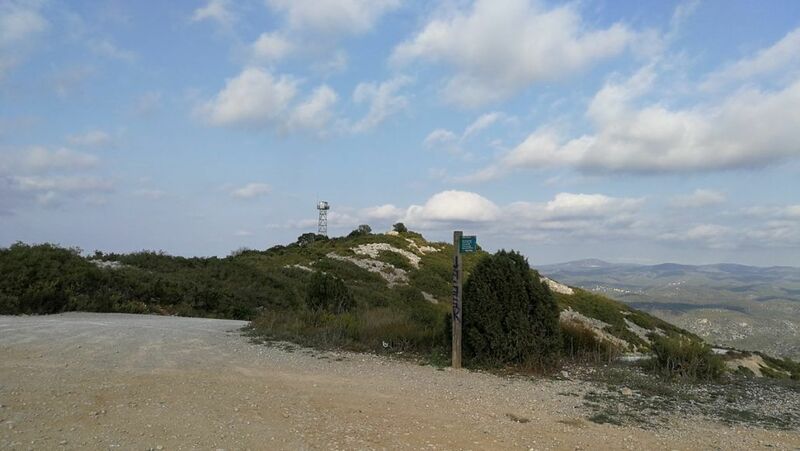 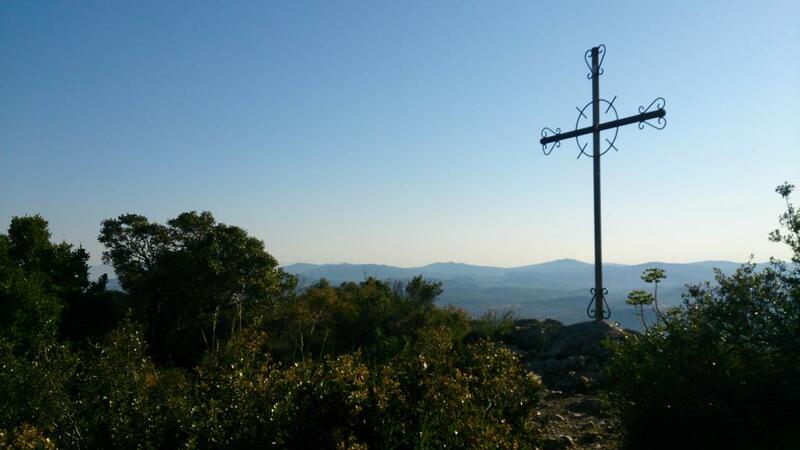 Continue the ascend through a trial that will bring you to the summit of Pic de l’Àliga, a privileged lookout over Canyelles region. 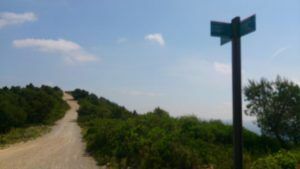 Keep walking for a bit along the crest and look for a hidden path that descends to a col. Take a sharp turn to the left and eventually you will get to the village of Daltmar. 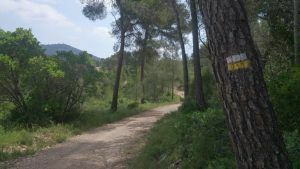 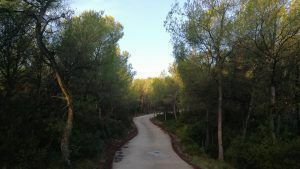 Follow the path that leads to Coll Blanc and, from here, there is an entertaining stretch that descends through Vall de Sant Joan. 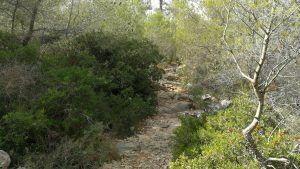 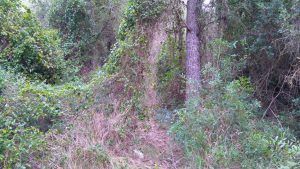 During this section, you will sometimes move parallel to the stream and you will pass by an ancient well, used by farmers in the area. After that, you will come across the track that goes to Torrelletes. 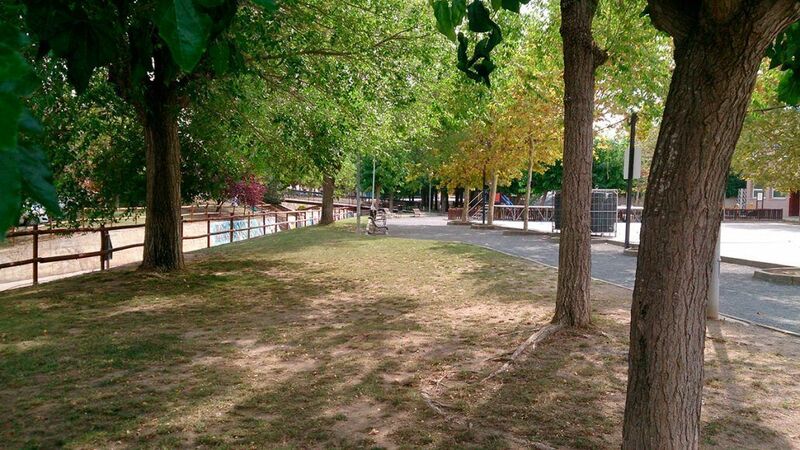 Before reaching this place, you will pass by “La Bovera”, an iconic nesting zone placed over your right side. 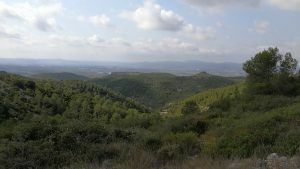 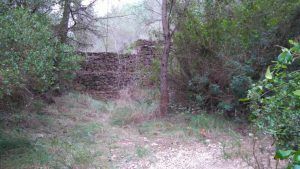 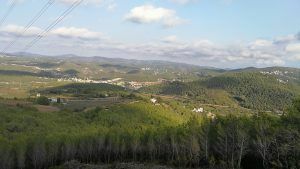 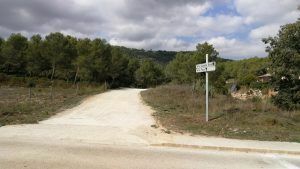 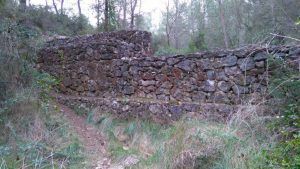 Once you are in the rural village of Torrelletes, go across it and continue descending towards the “Torrent de las Bruixes”. Cross the stream and follow the uphill path (made of stone slab) that leads to Can Balaguer, a group of old farmhouses. 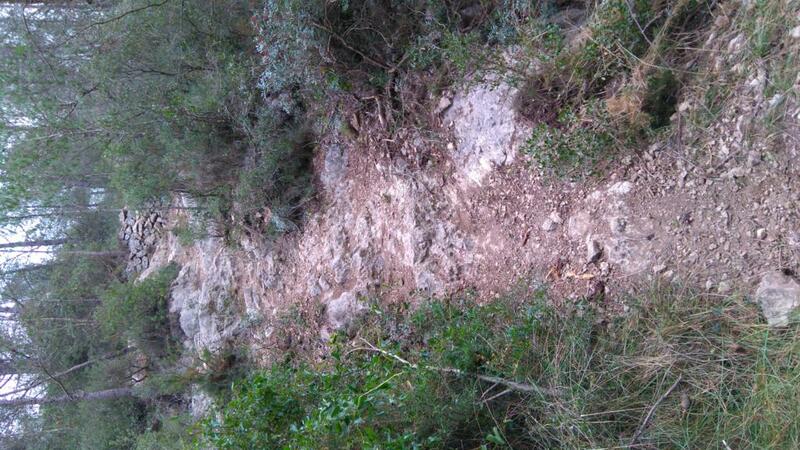 Be careful when passing by that rocky path, specially during rainy days. Go past the old houses and follow a paved track that will bring you to the remains of Can Cassanyes. 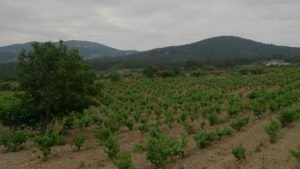 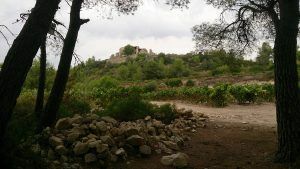 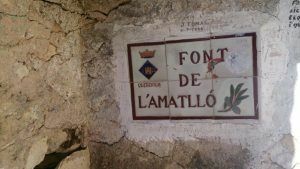 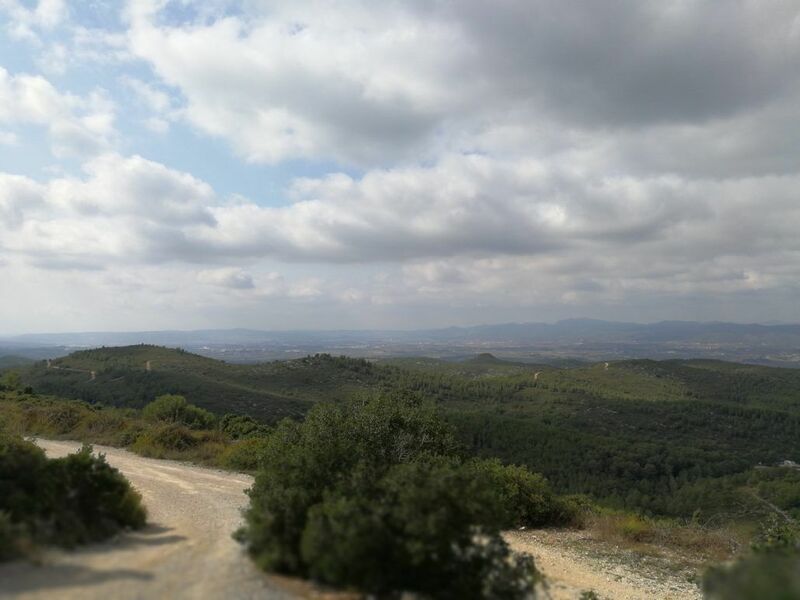 Go across the vineyards and look for a narrow path that leads to Pla de les Palmeres, a well-known col among local athletes. The route continues through a rocky stretch for a few kilometers until it joins a track that should be walked for 1500 meters. 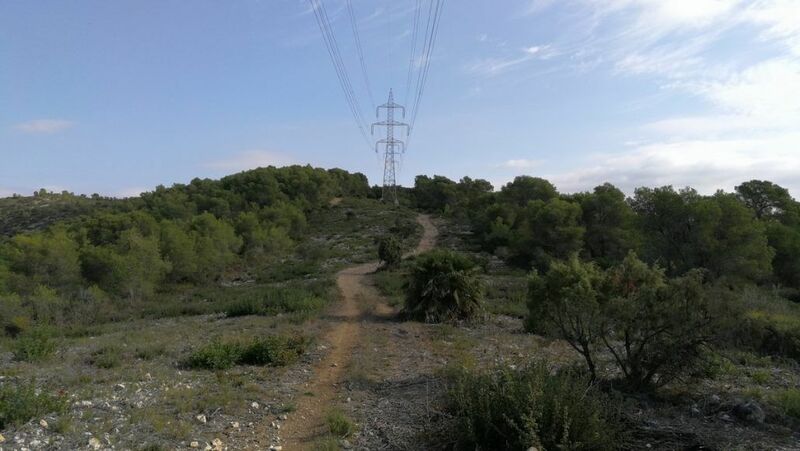 After the last uphill section you will reach an electric tower. 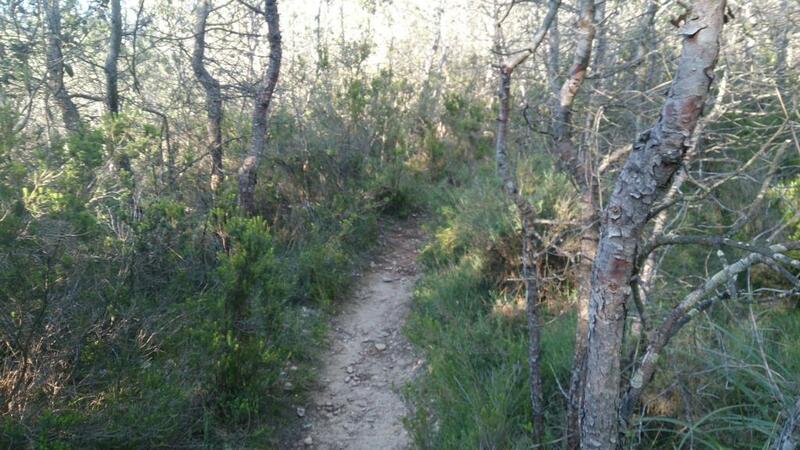 Take a sharp turn to the right and you will come back to the first path you followed at the beginning of the circuit. 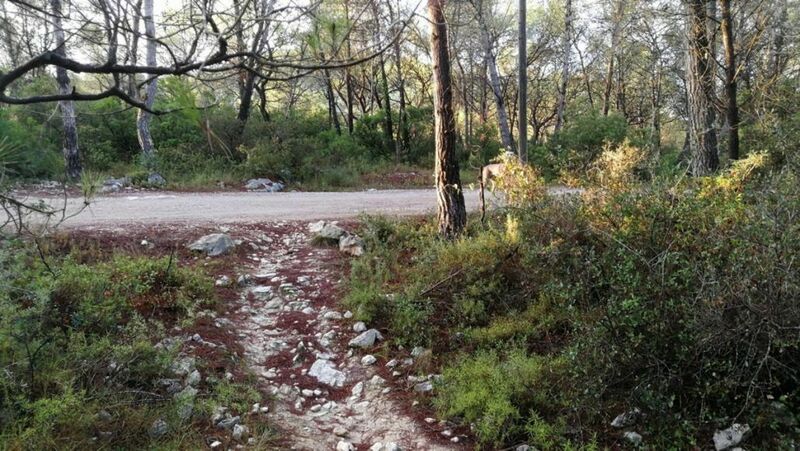 From there, you just need to retrace your steps to the starting point in Canyelles. 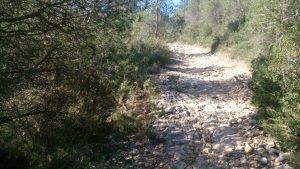 WATER: There is access to water in Canyelles and in Torrelletes. 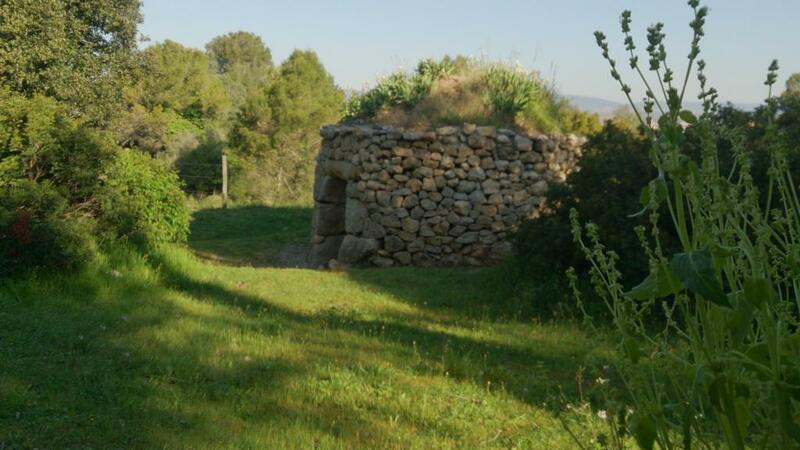 TOURISM: Canyelles; Torrelletes; historical farmhouses (Casa Alta, Can Casanyes, Can Balaguer). This route will be done mainly by track, combining some easy and technical stretches. 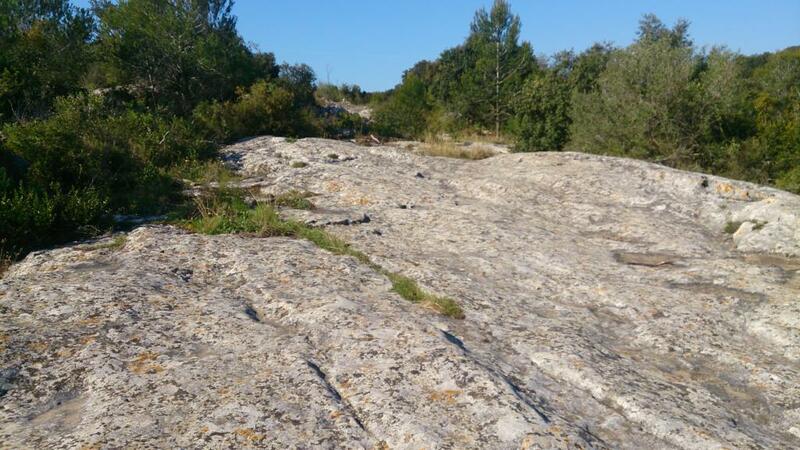 In the first kilometers you will notice some ropes, that could be used as handrails for extra support. The best time to do this circuit is from autumn to spring. 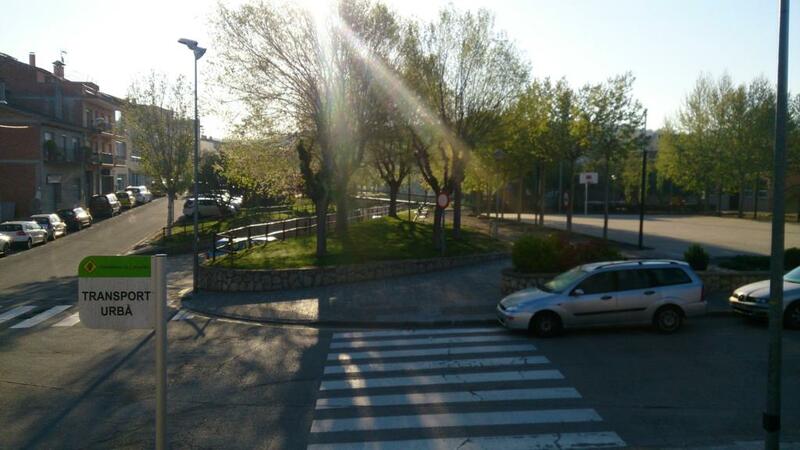 Avoid the central months of the year because of the high temperatures. But if you still decide to do this trail in summer, it is recommendable to start early in the morning and make sure you carry plenty of water, because there is no access to it during the trail. 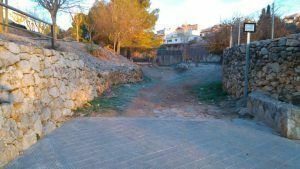 Starting from Plaça del Casal, go across the town following the stream until you turn right in the first street you find, passing by the ADF warehouse. 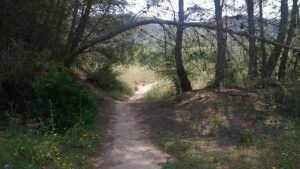 Leaving the paved ground behind, follow the wide path that eventually will narrow. 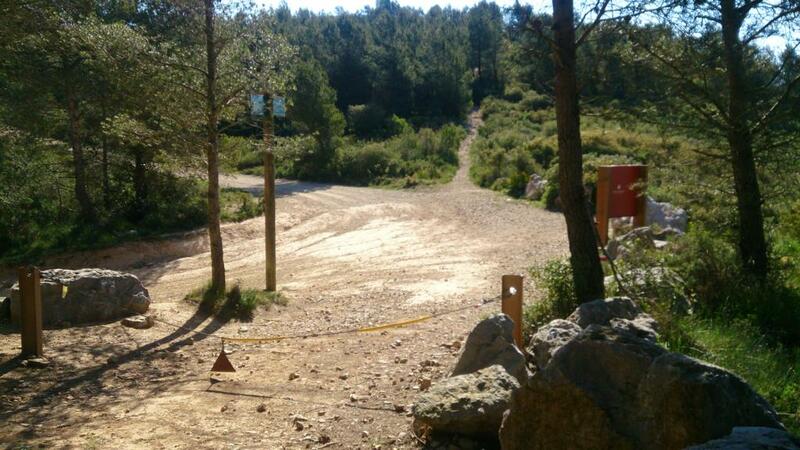 After crossing a road and doing a flat section, turn right and you will get to the climbing wall of “La Facu”. 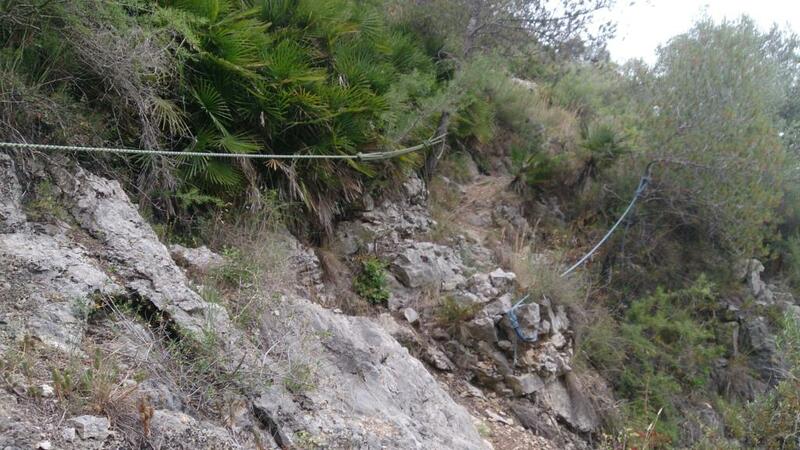 In these walls you will find the rope that will help you along the rocky ascent, till you get to a track. 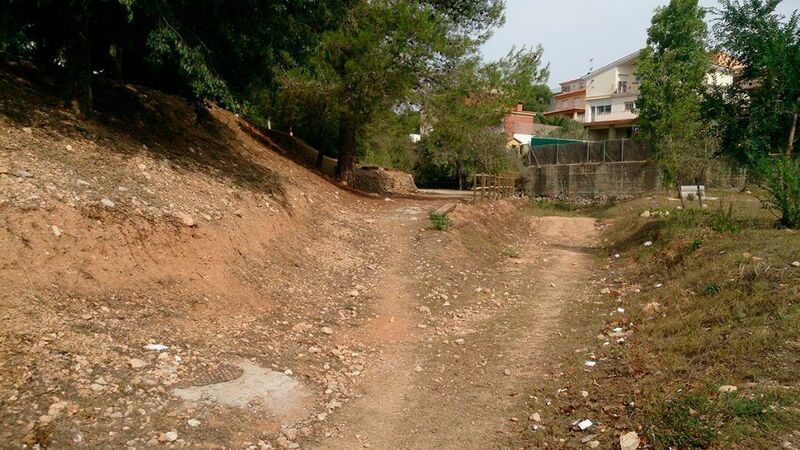 Following that downhill track, turn right and continue until you find a village. 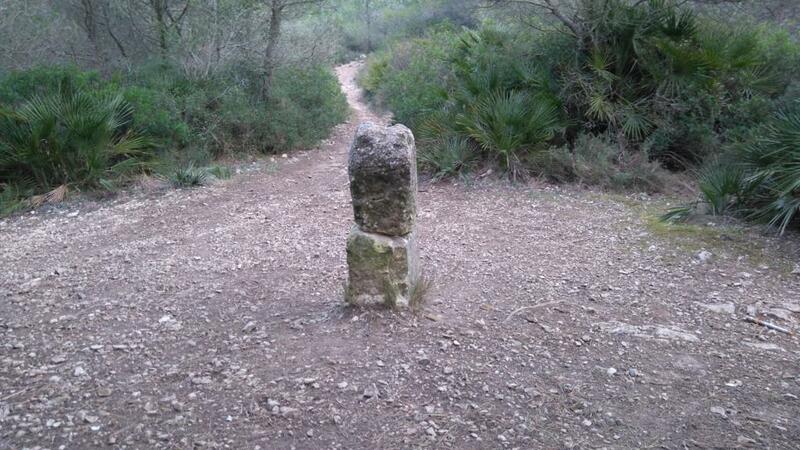 Go across it and shortly after you will be in Parque de Olèrdola. Follow the trial on the left that will take you to cross the road between Moja and Daltmar. 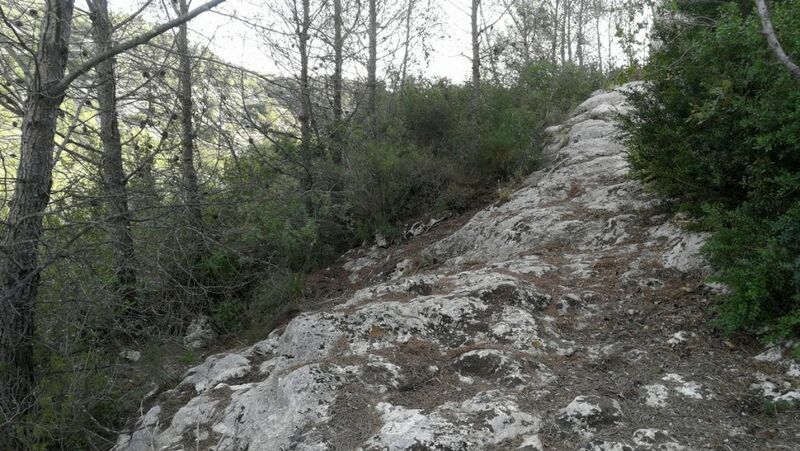 Continue by path until you come across a track that will ascend towards Turó de Sanabre. 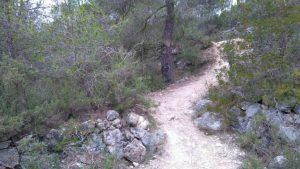 The same track will get you straight after to Coll Blanc. Take a 90º turn to the right and start the descent through Vall de Sant Joan. 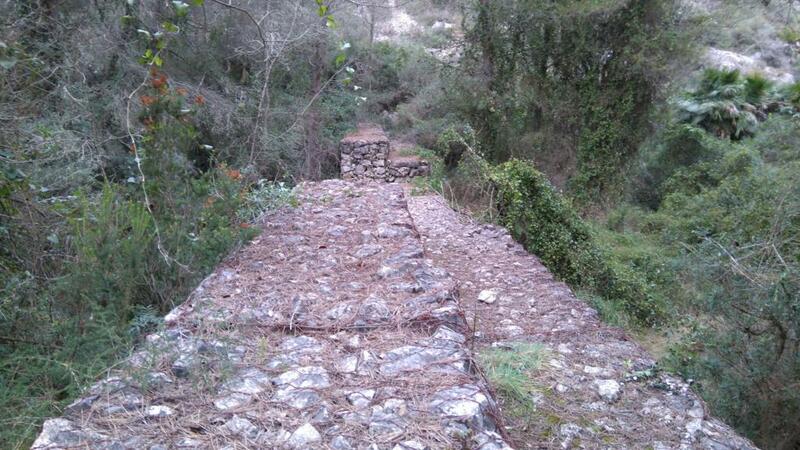 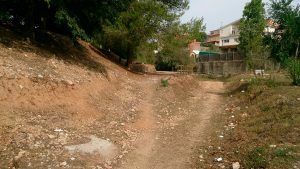 This will be done by a narrow path that, after a couple of technical sections, will take you to Casa Alta. 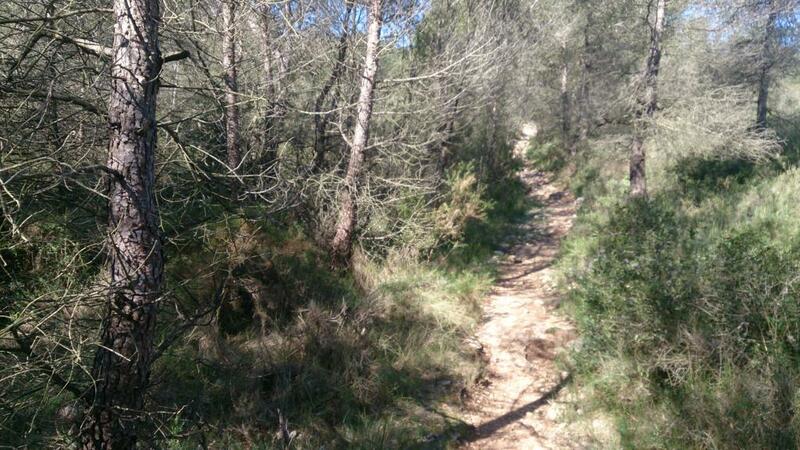 From there, follow the track that on constant uphill will bring you to Pla del Pic de l’Àliga. 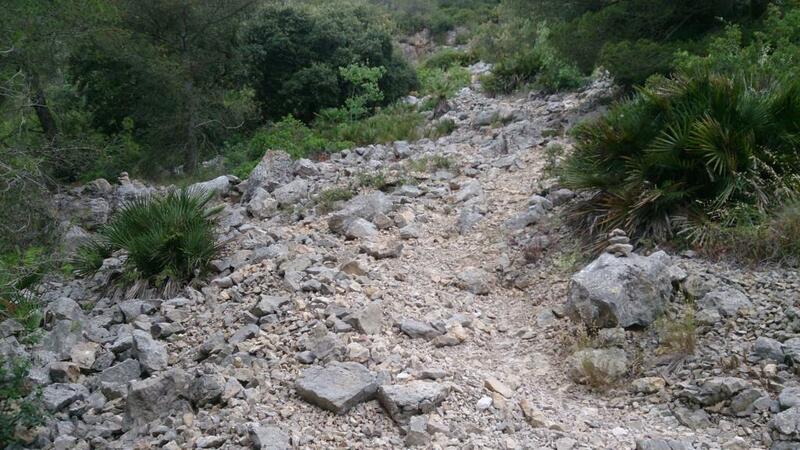 The descent to Canyelles will be done first through a trial and then by an easy to follow track. 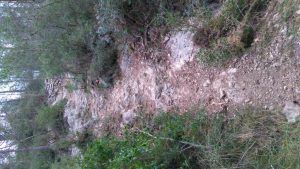 WATER: There is access to water in Canyelles. 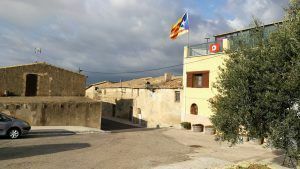 TOURISM: Canyelles; Olèrdola; historical farmhouses.